Ron and Ester Shultz make some of the most charming, colorful and interesting bakelite being crafted today. 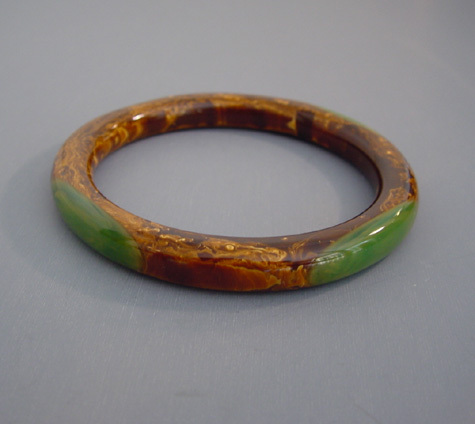 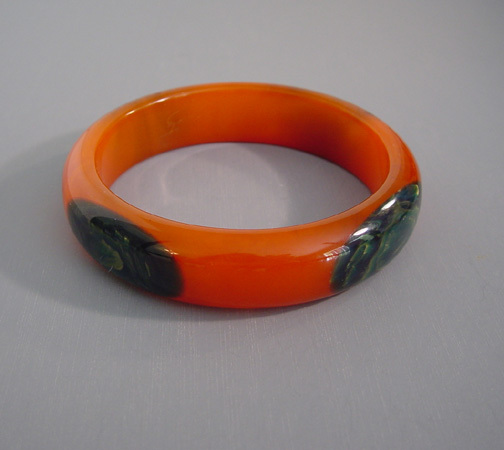 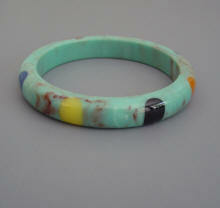 They utilize older pieces of bakelite, which they re-work, carve, polish and paint to create their pieces. 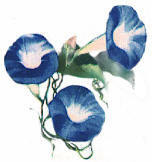 Not only are they talented and creative, but their jewelry is extremely wearable and collectible. 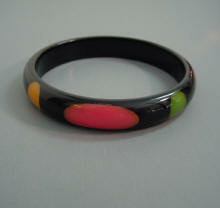 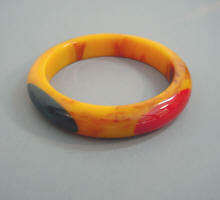 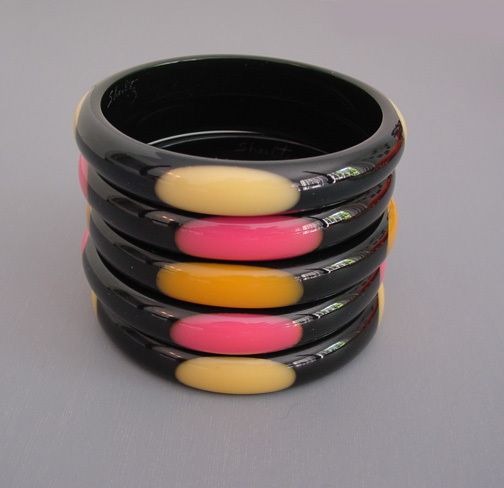 To buy SHULTZ BAKELITE JEWELRY CLICK HERE! 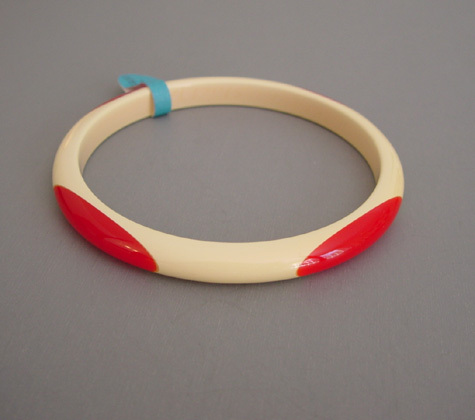 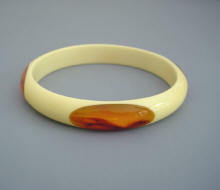 To read more about SHULTZ BAKELITE JEWELRY, see our article in JEWEL CHAT on line Magazine. 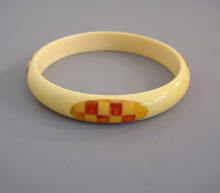 SHULTZ bakelite pale apple juice bangle with reverse carved and painted brown slashes, 2-1/2" by 1/2" by 1/4". 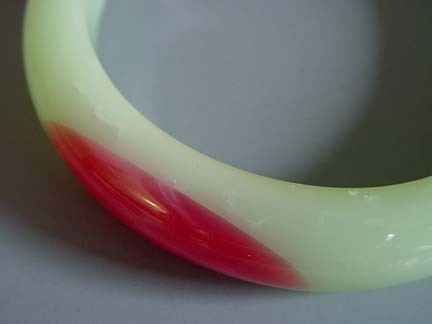 #B65472. 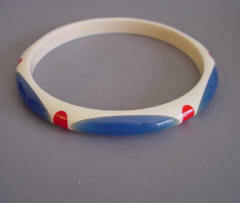 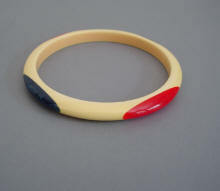 SHULTZ bakelite pale apple juice bangle with reverse carved slashes in red and blue, set of 2, each 2-1/2" by 5/8" by 1/3". 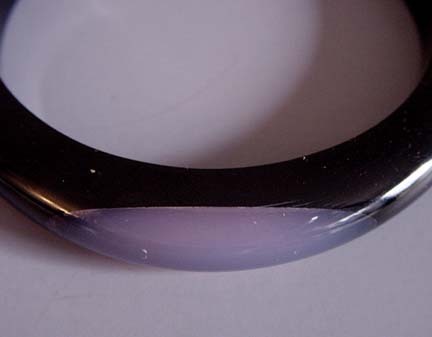 #B65473. 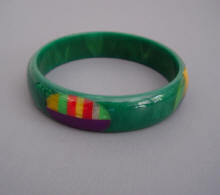 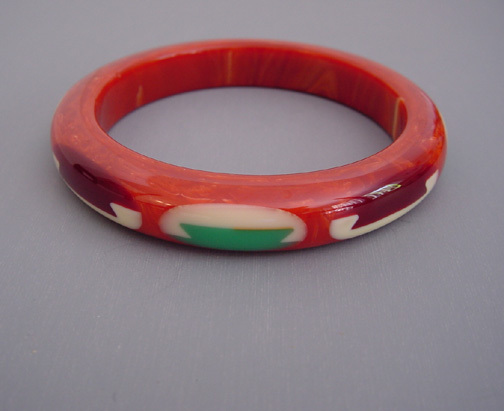 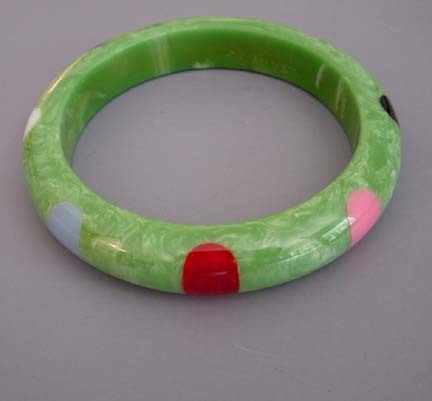 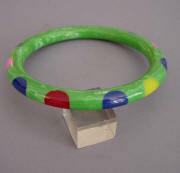 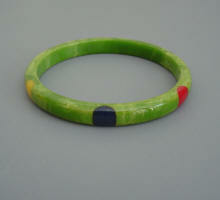 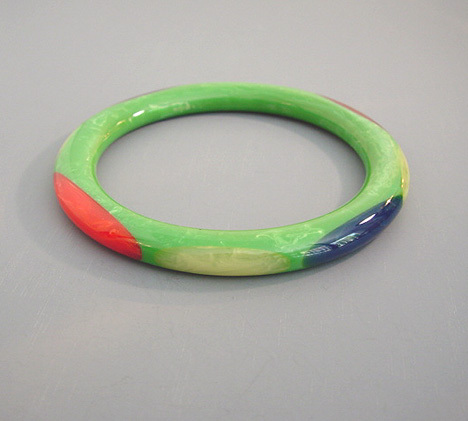 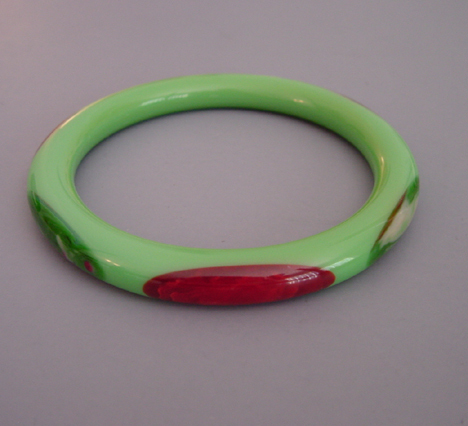 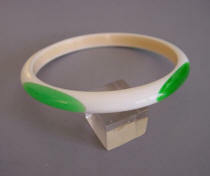 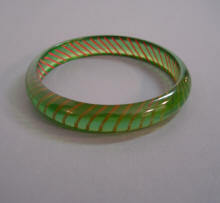 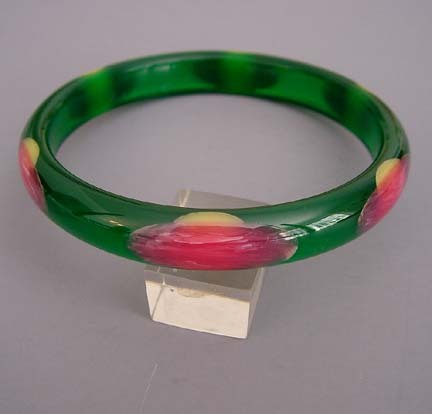 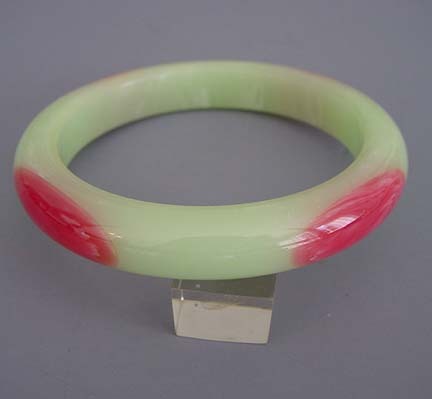 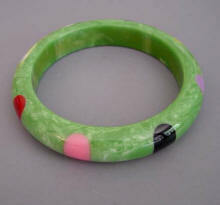 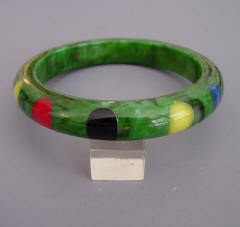 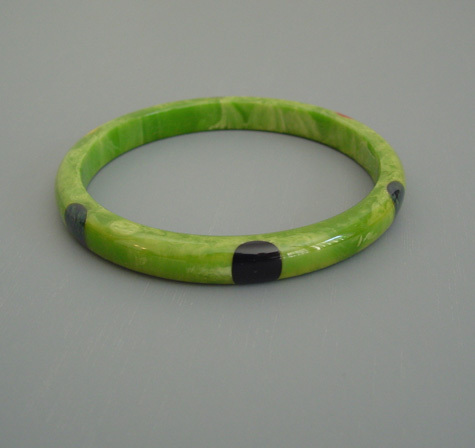 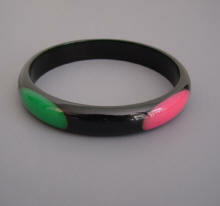 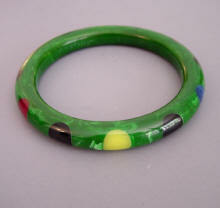 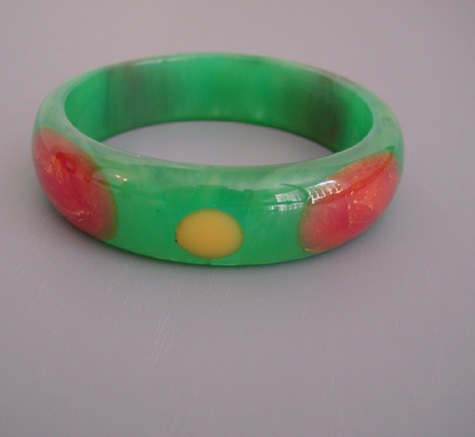 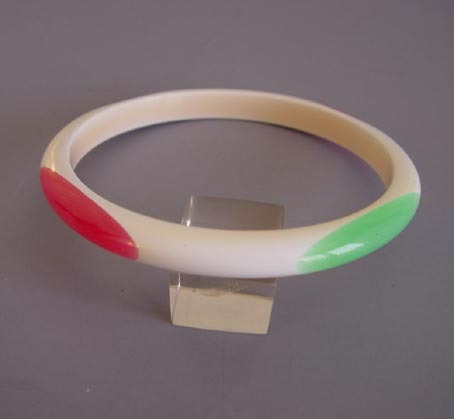 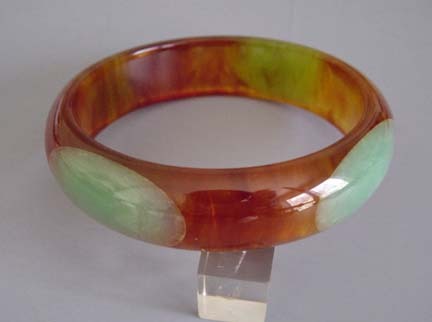 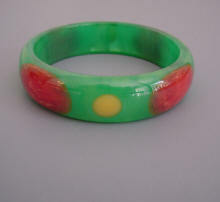 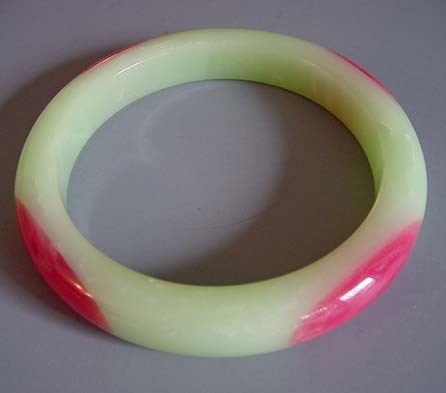 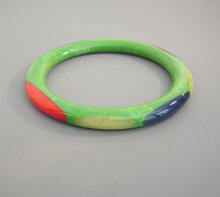 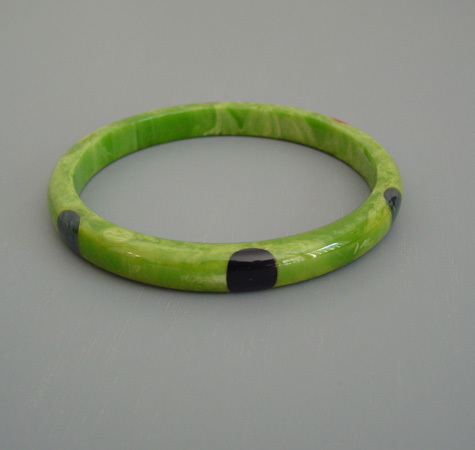 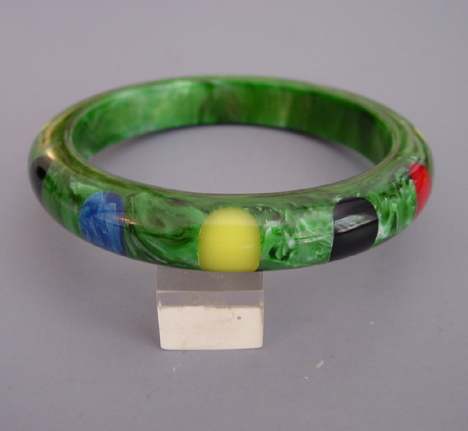 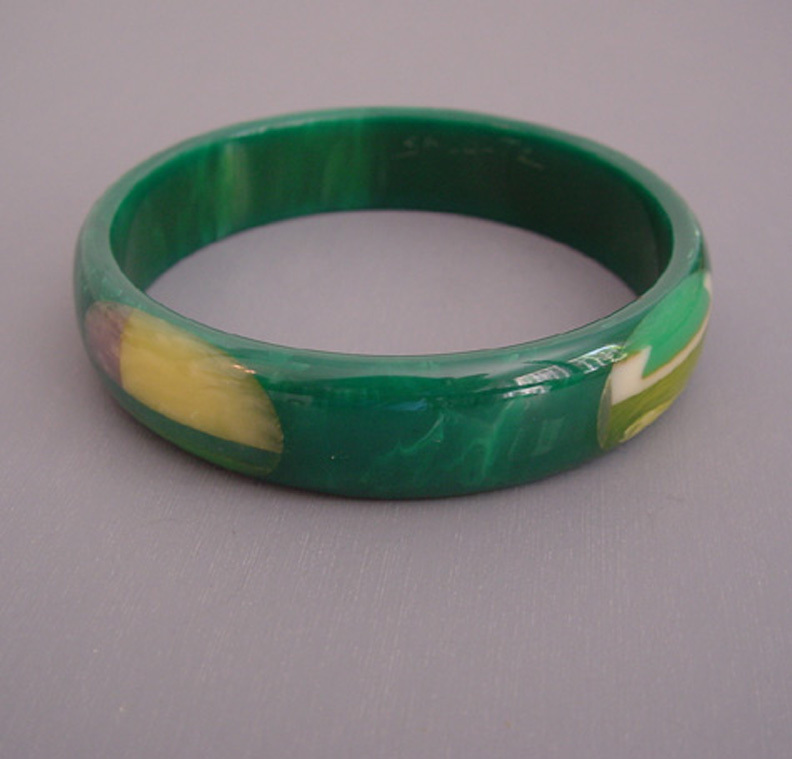 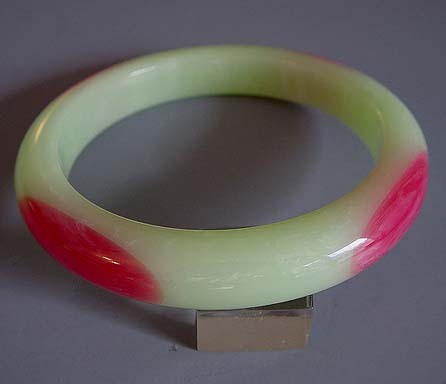 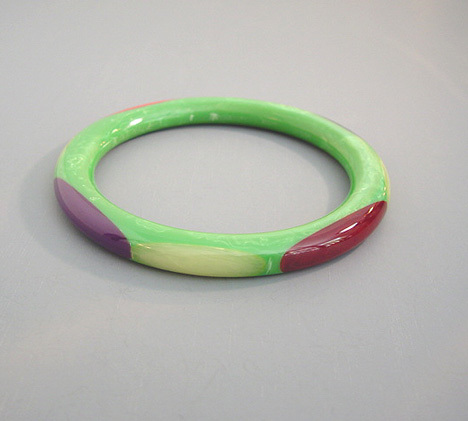 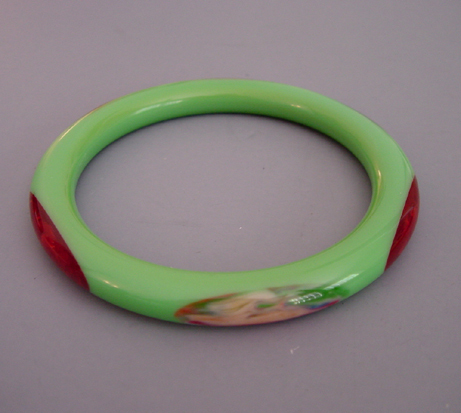 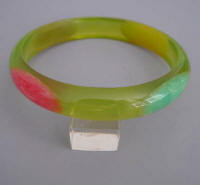 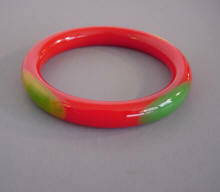 SHULTZ bakelite transparent green bangle with reverse carved and painted red slashes, 2-1/2" by 1/2" by 1/4". 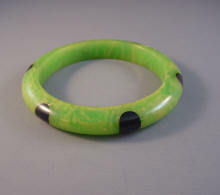 #B65475. 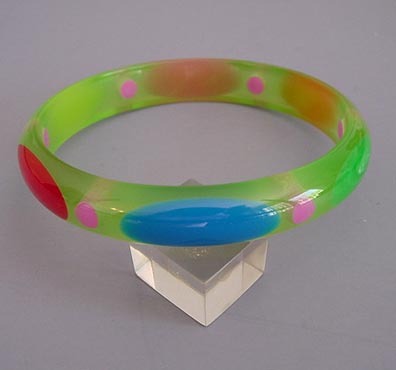 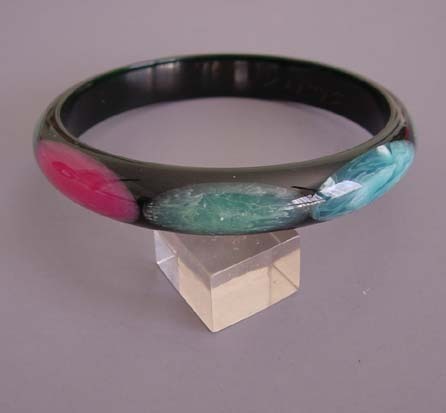 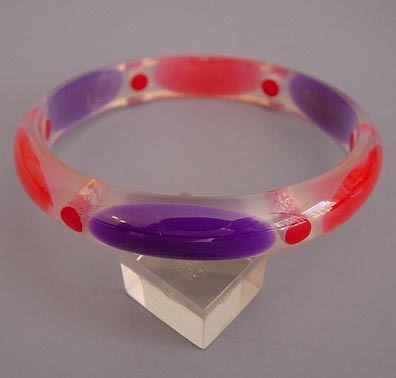 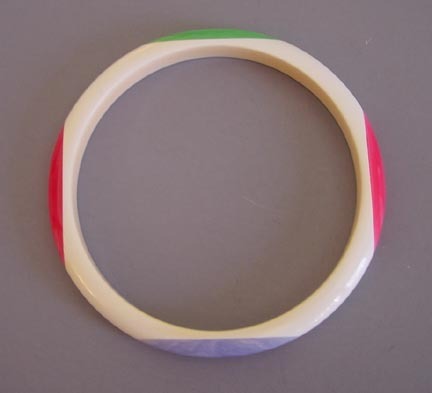 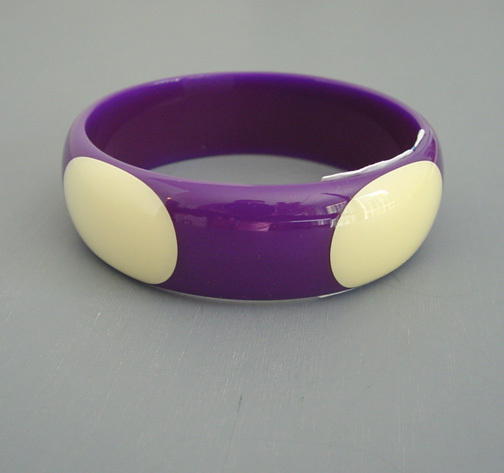 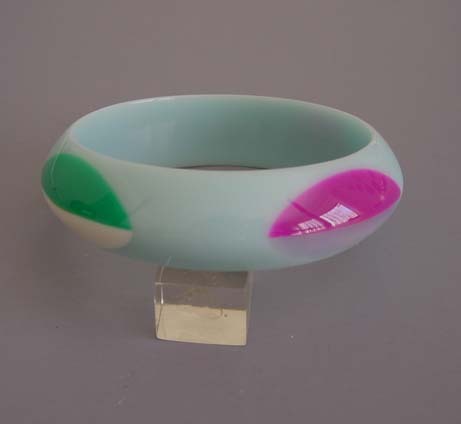 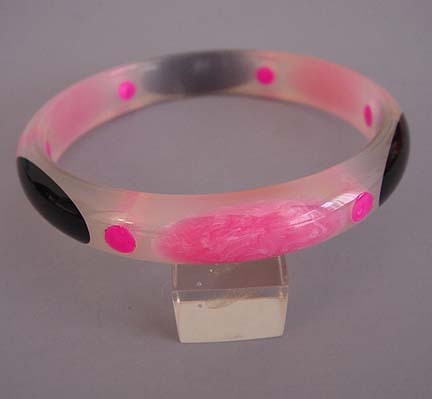 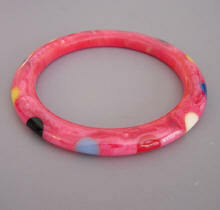 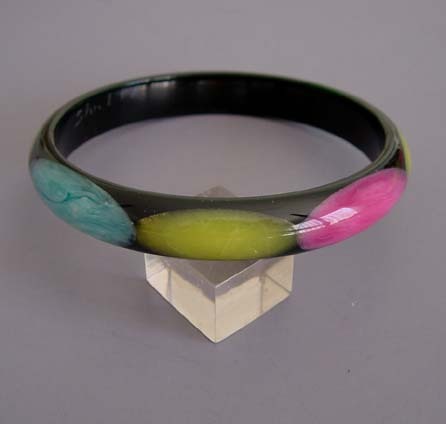 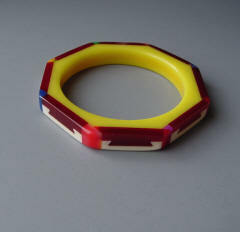 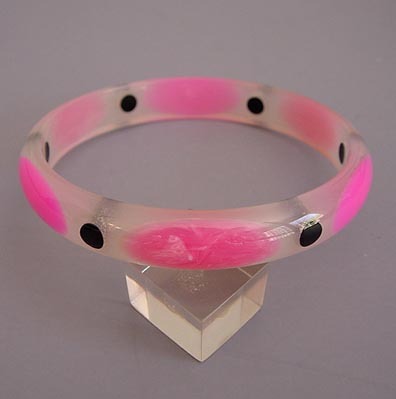 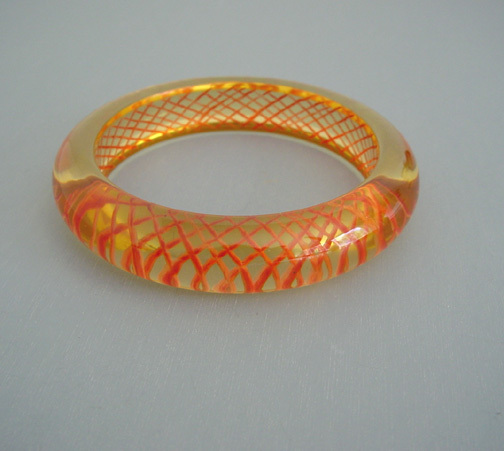 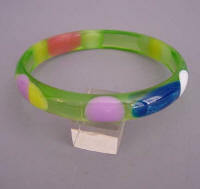 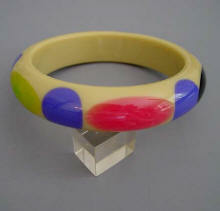 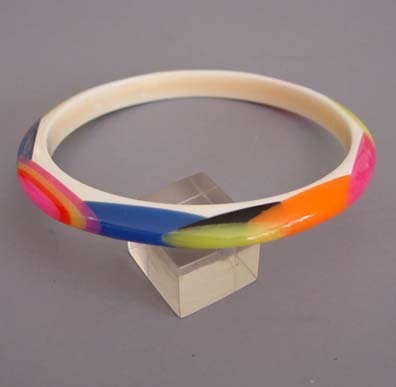 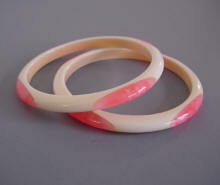 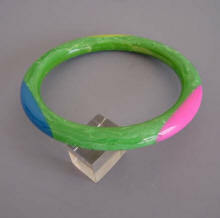 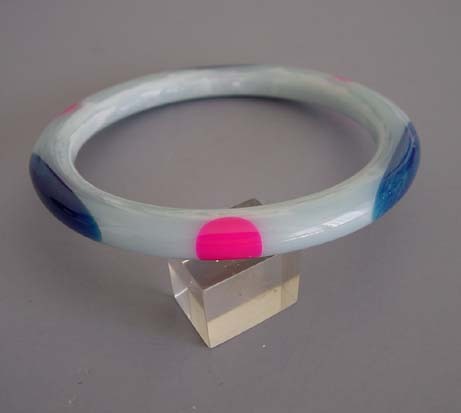 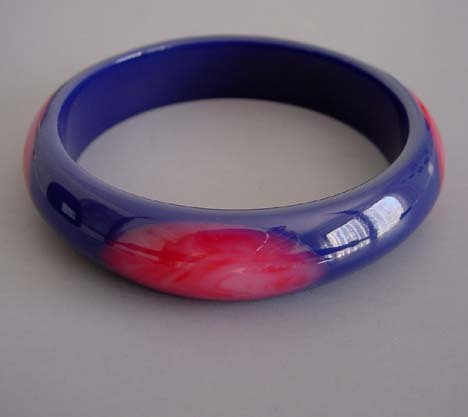 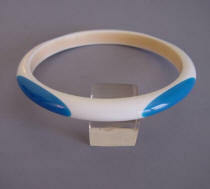 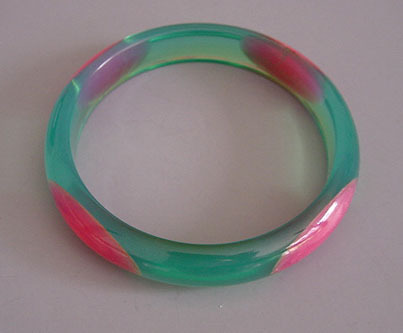 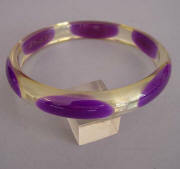 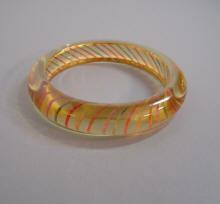 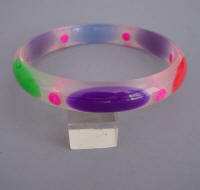 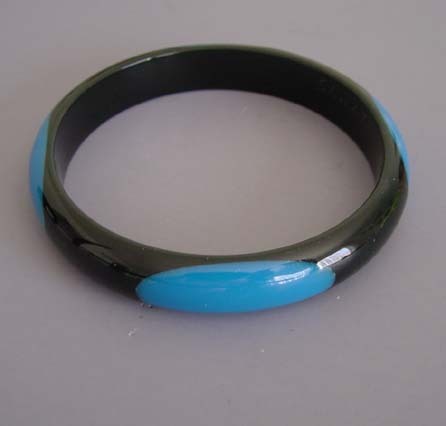 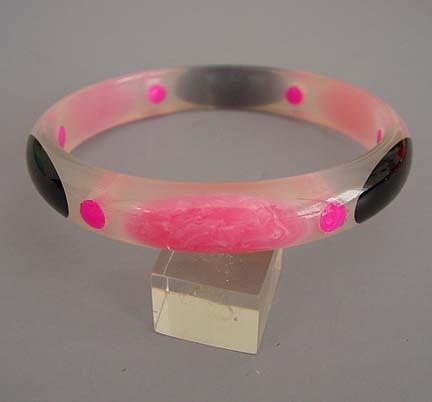 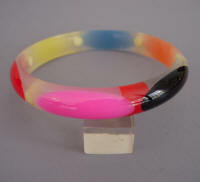 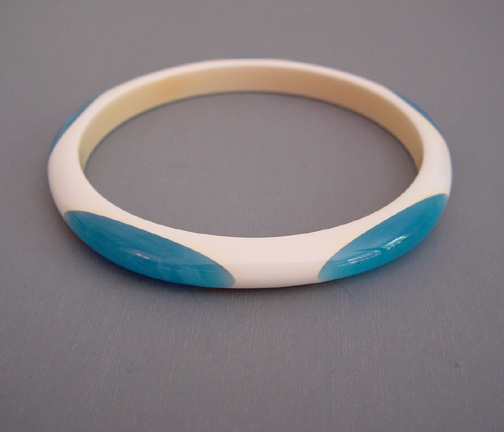 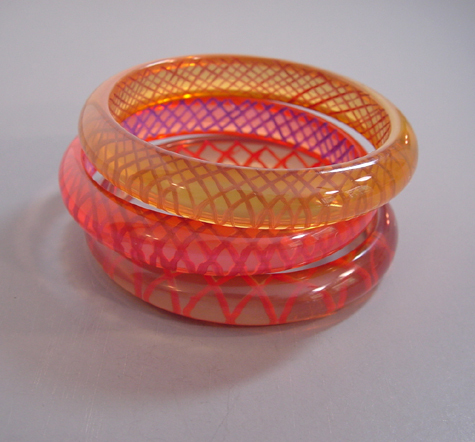 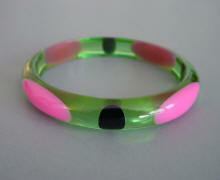 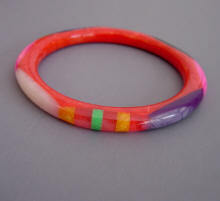 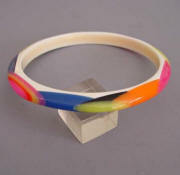 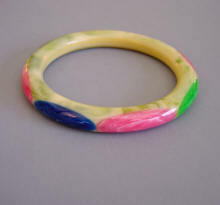 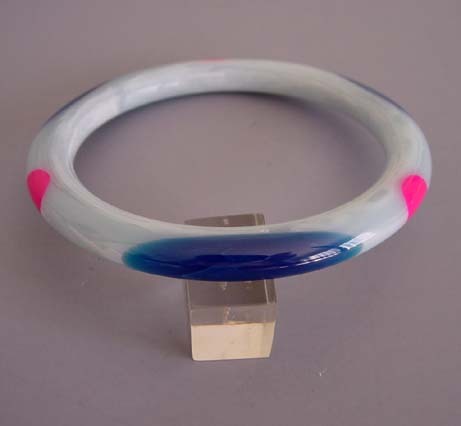 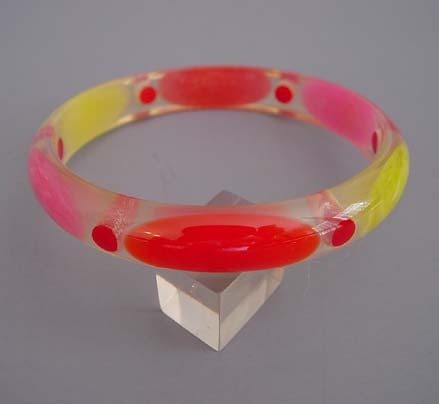 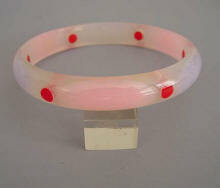 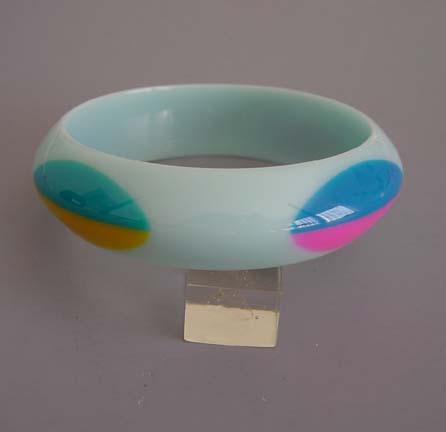 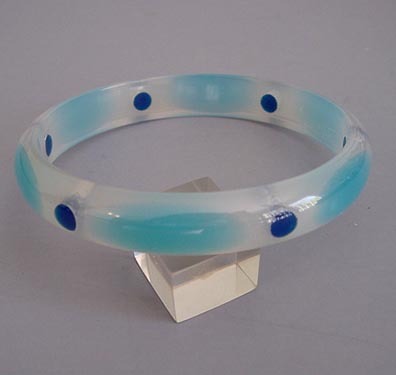 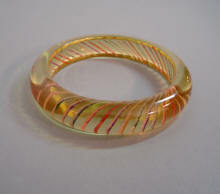 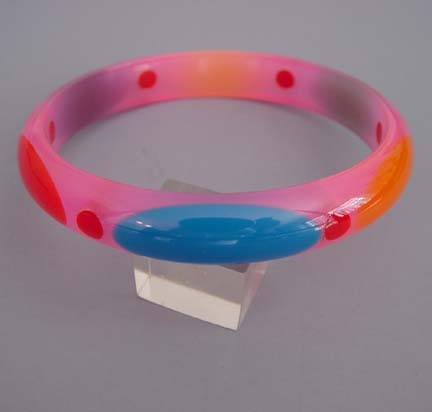 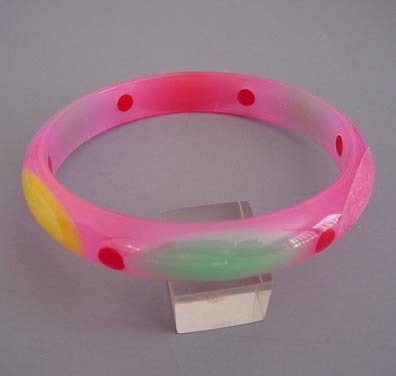 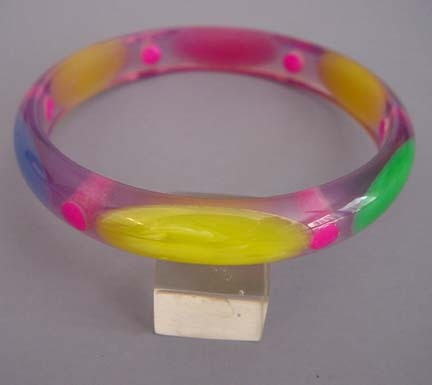 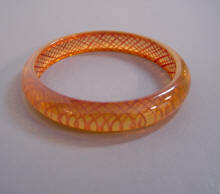 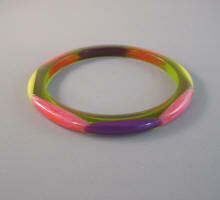 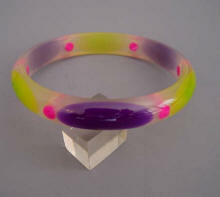 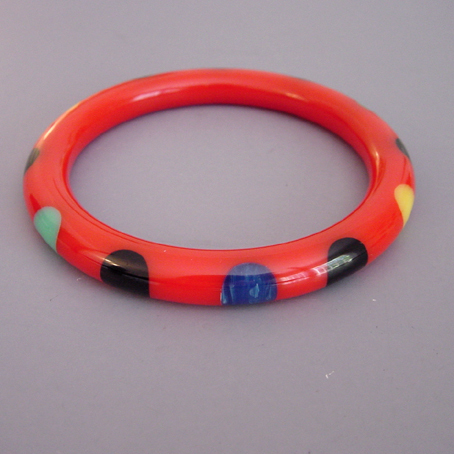 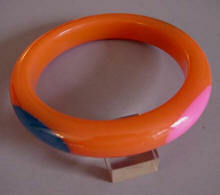 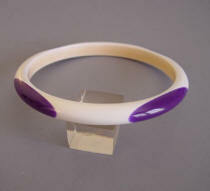 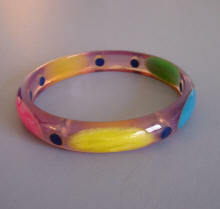 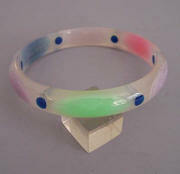 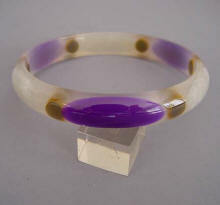 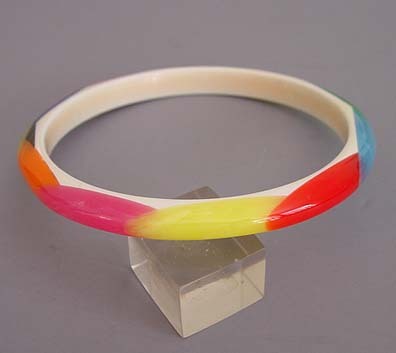 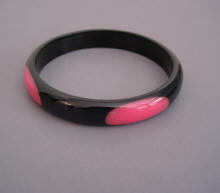 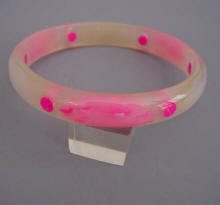 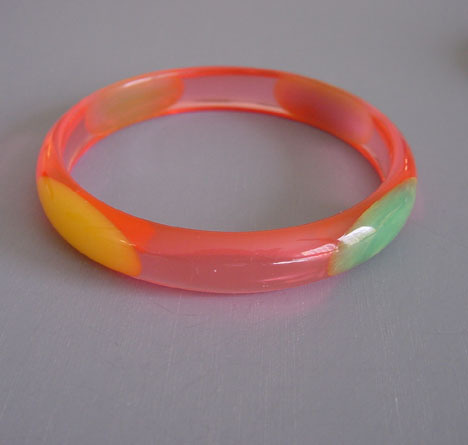 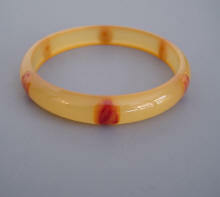 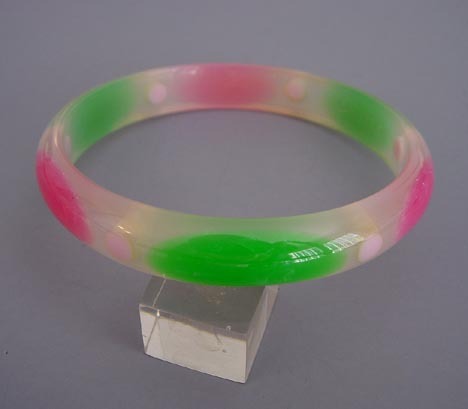 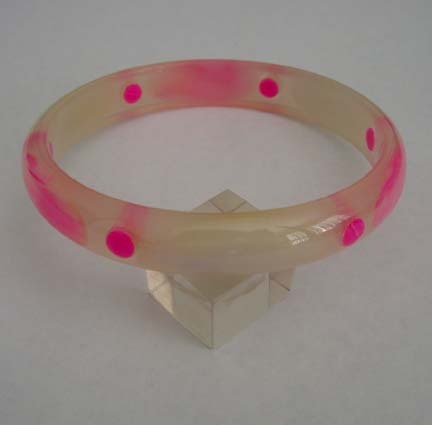 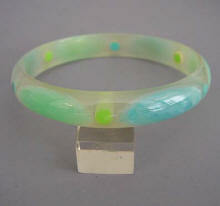 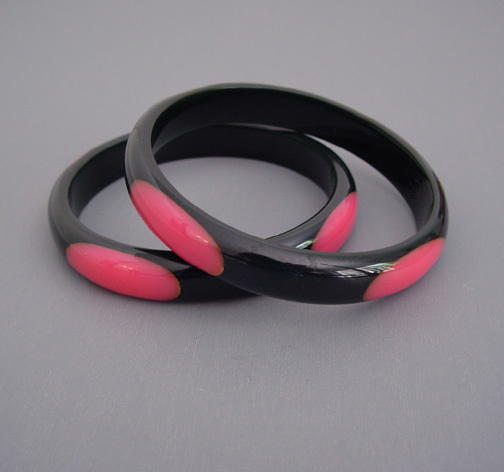 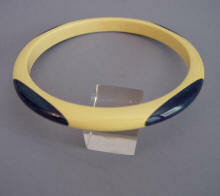 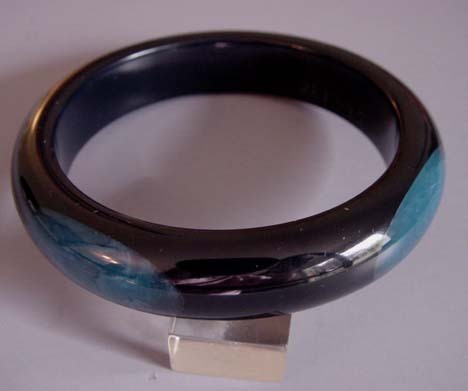 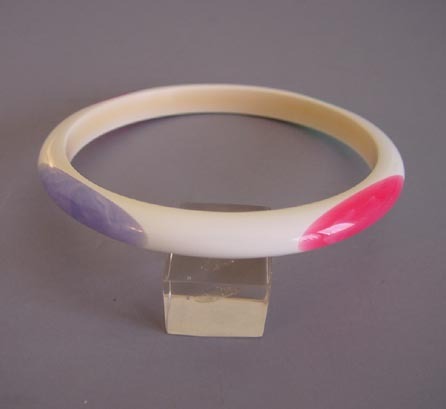 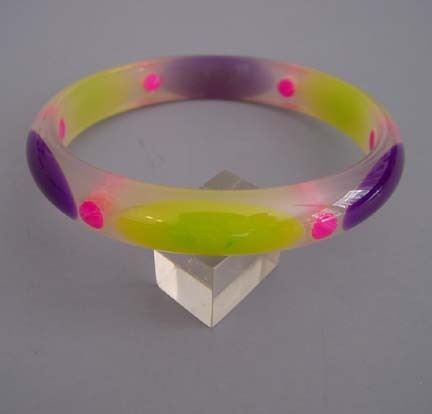 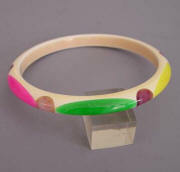 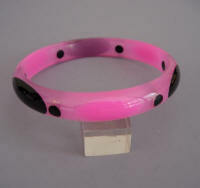 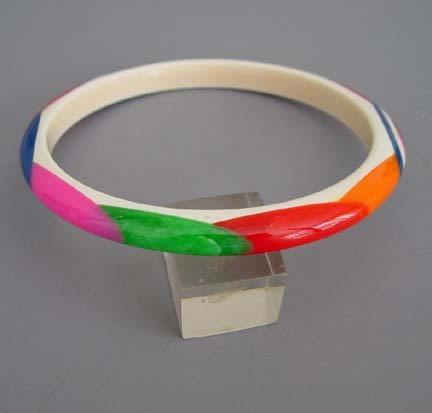 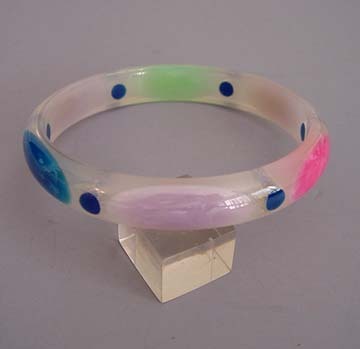 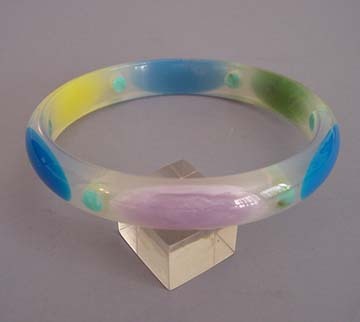 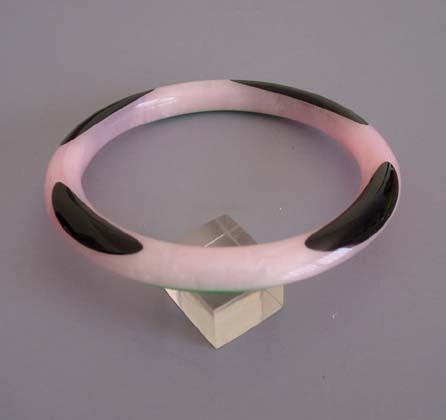 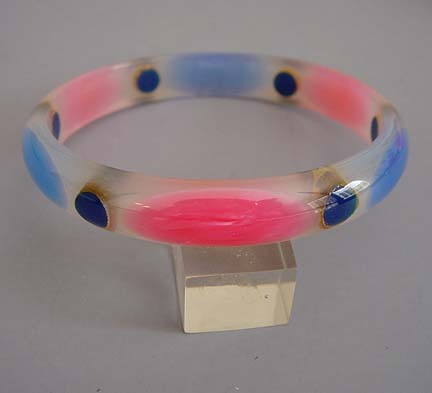 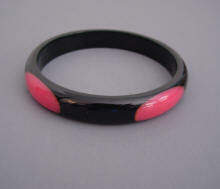 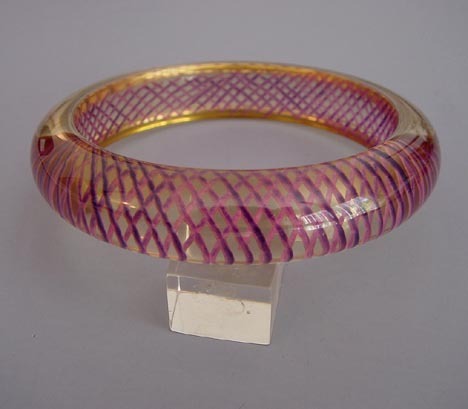 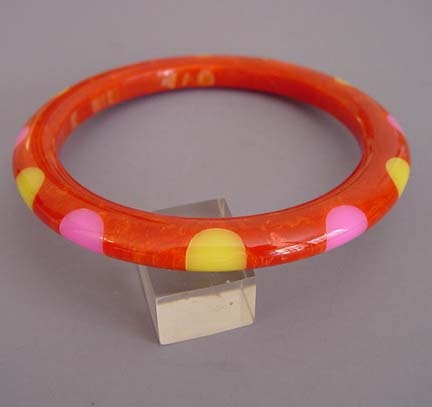 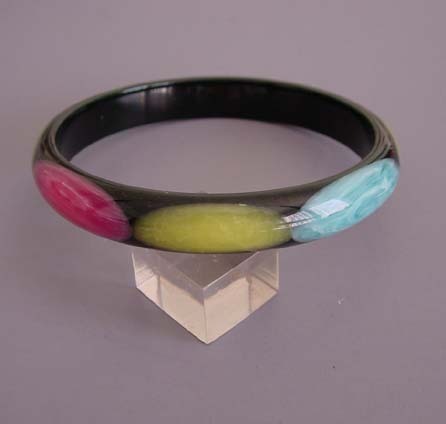 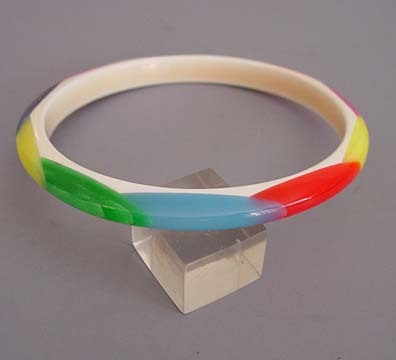 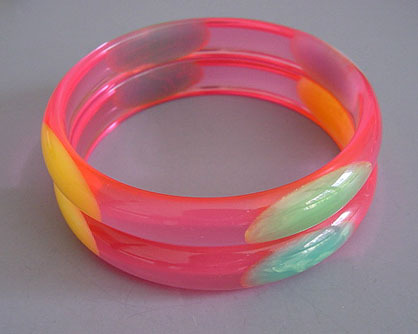 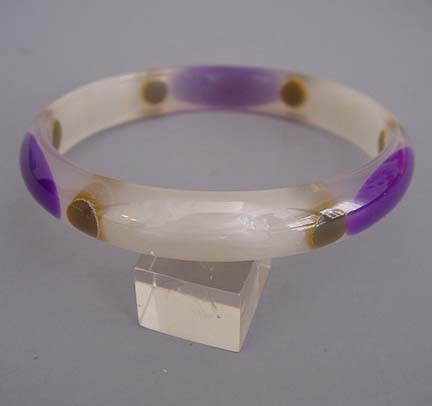 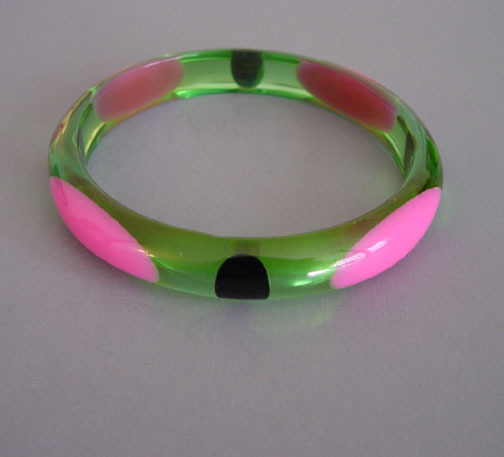 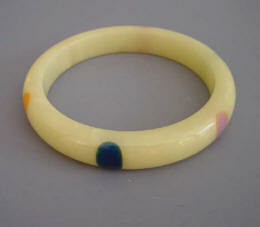 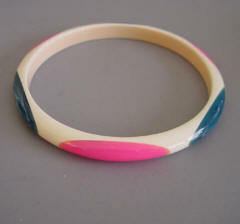 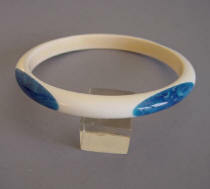 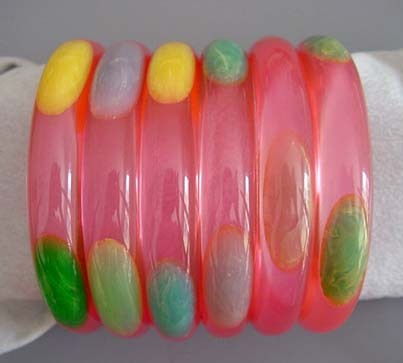 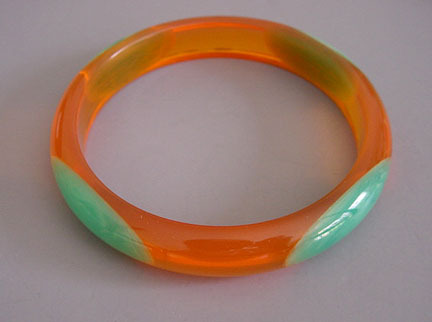 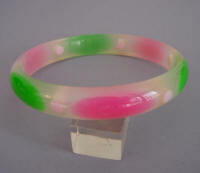 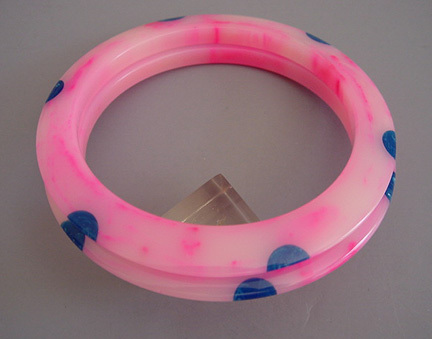 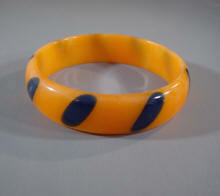 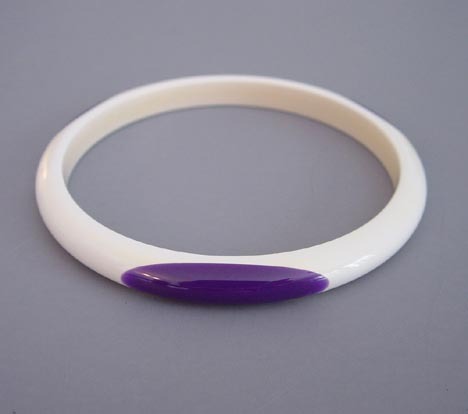 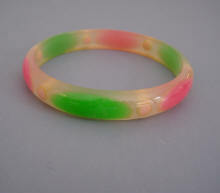 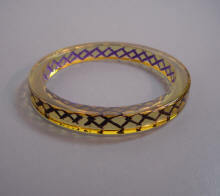 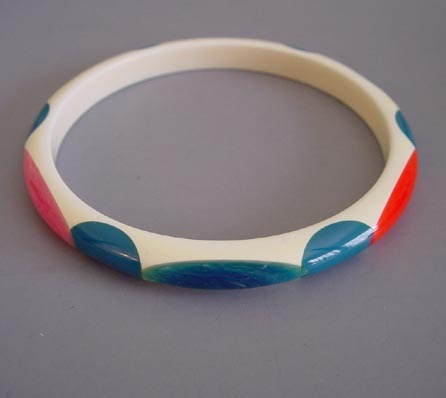 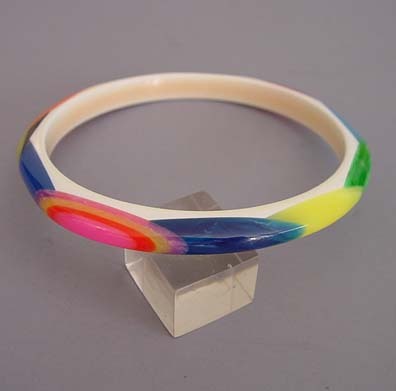 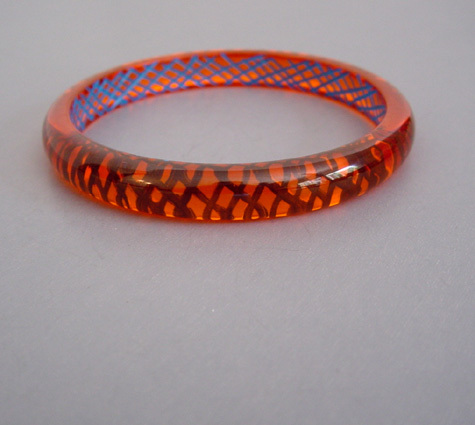 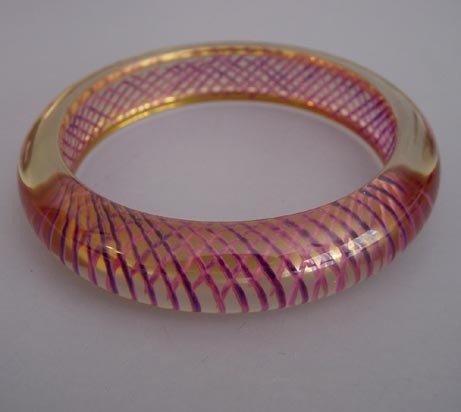 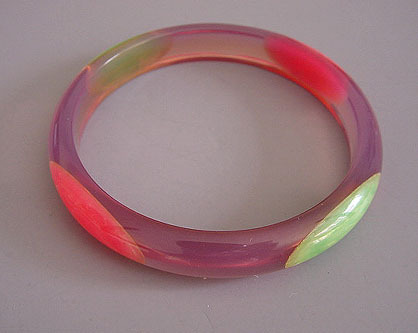 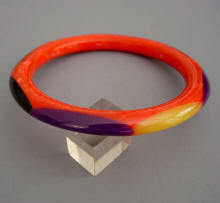 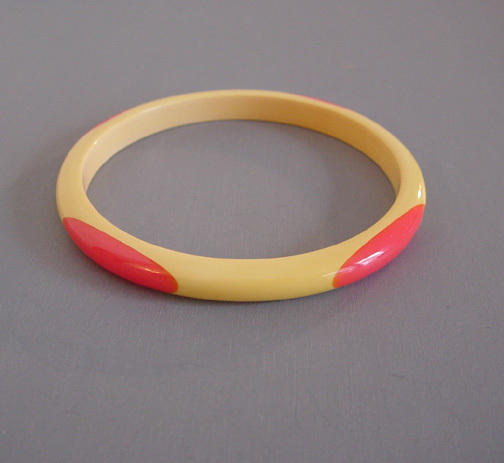 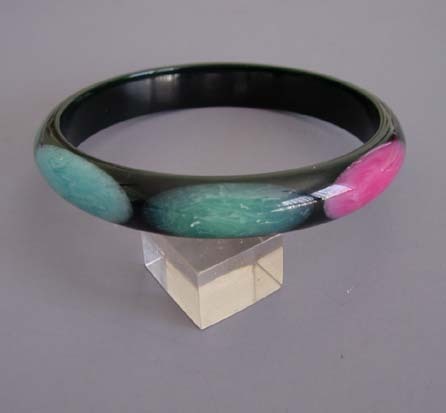 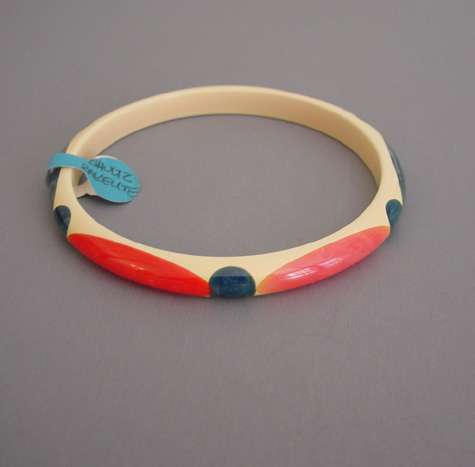 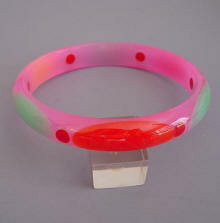 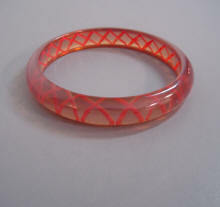 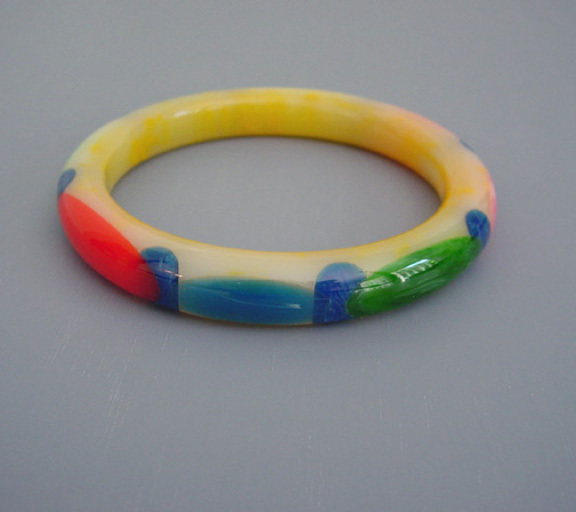 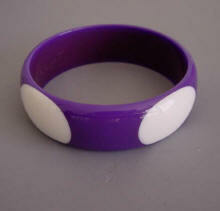 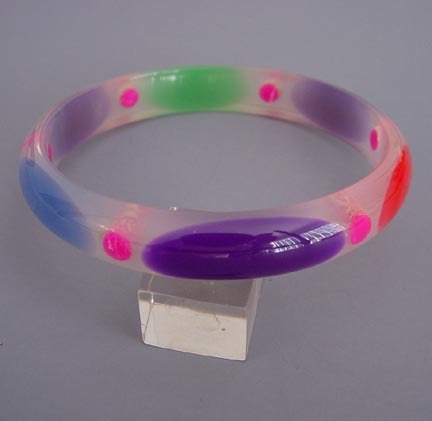 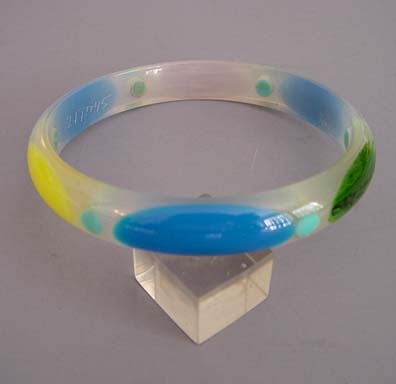 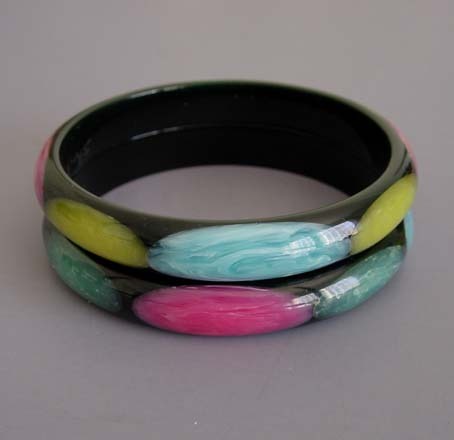 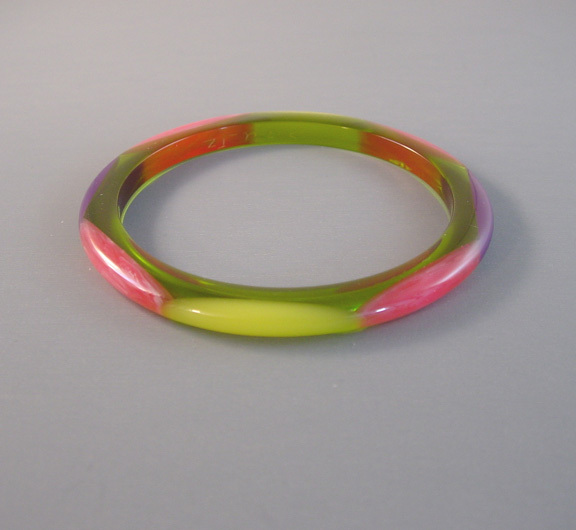 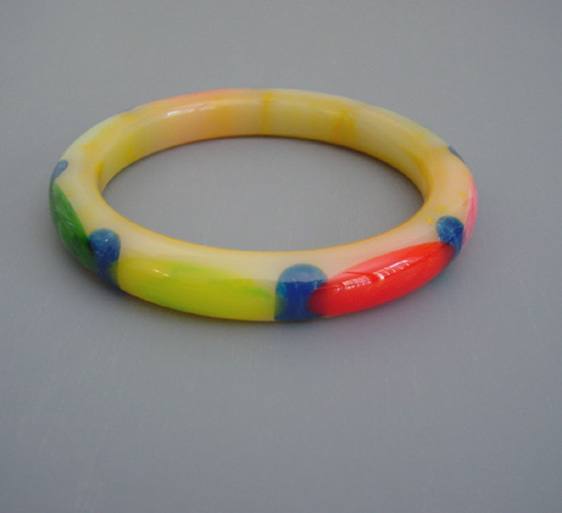 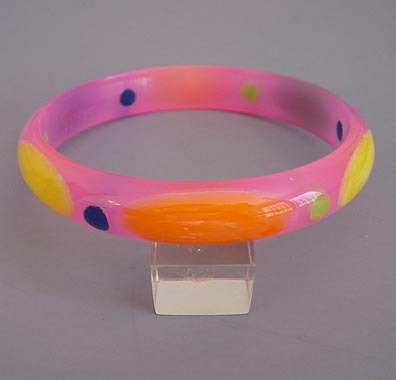 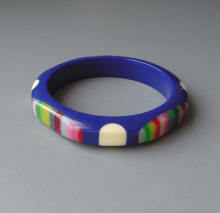 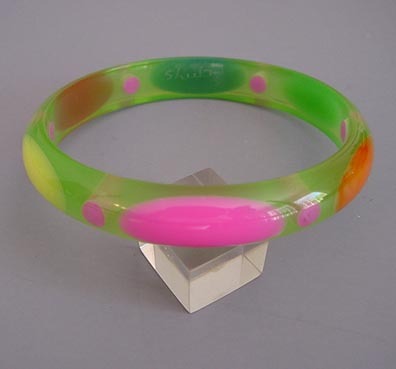 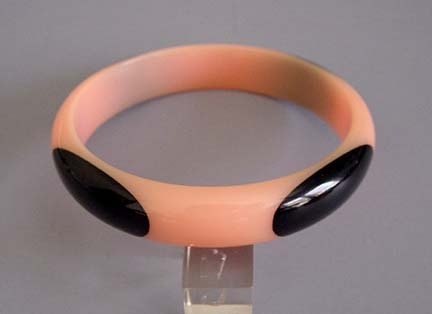 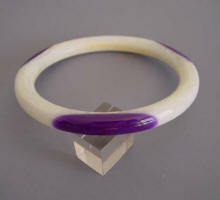 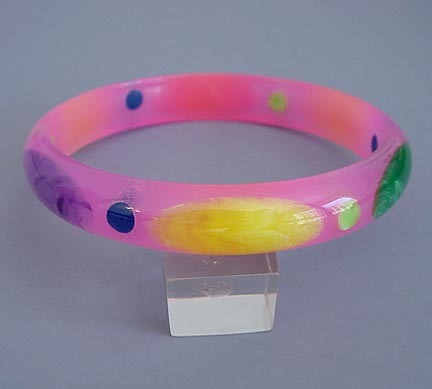 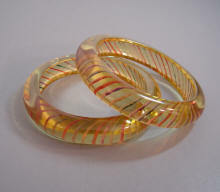 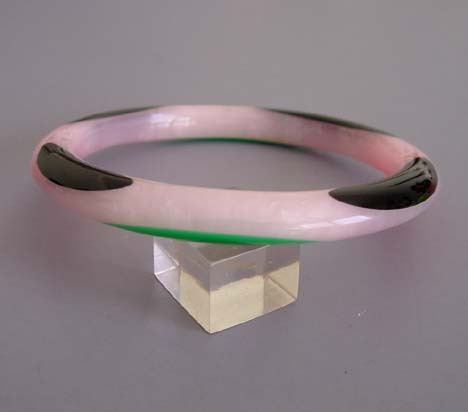 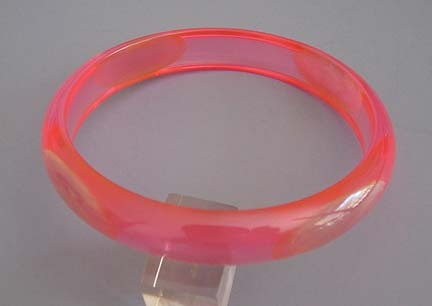 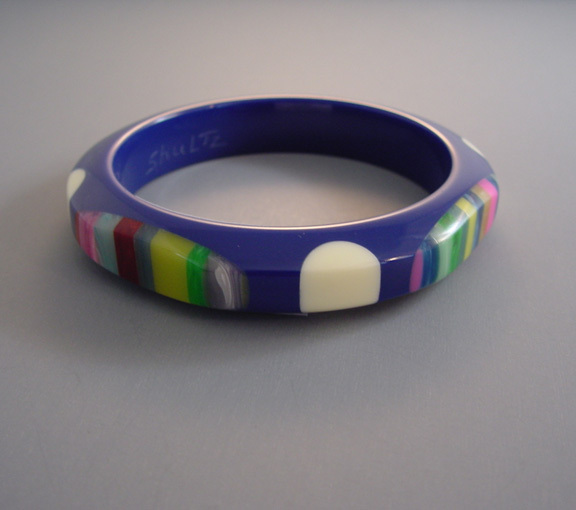 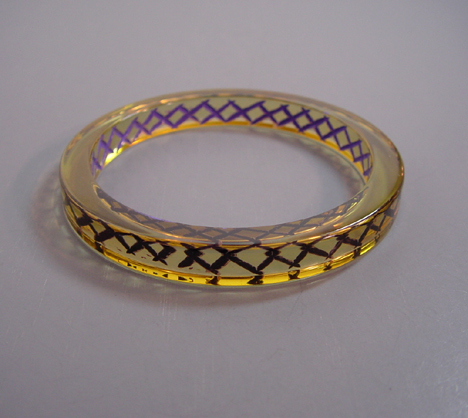 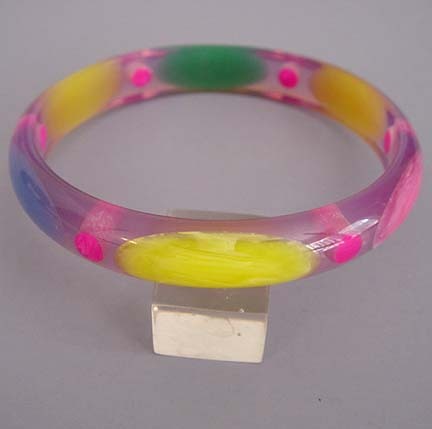 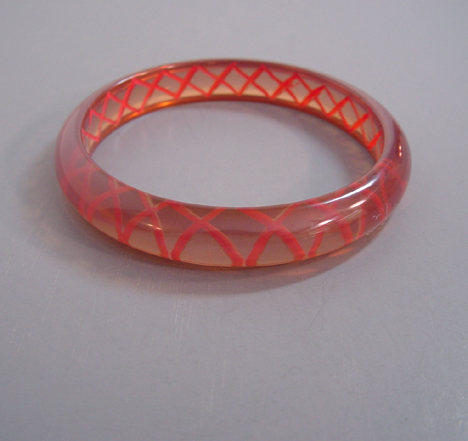 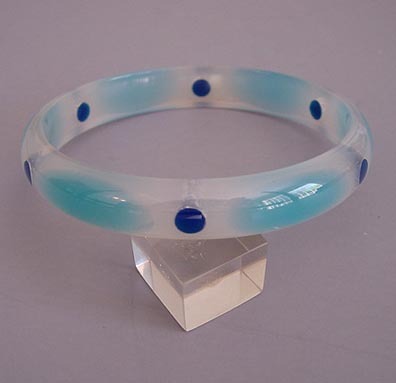 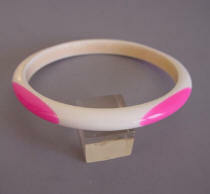 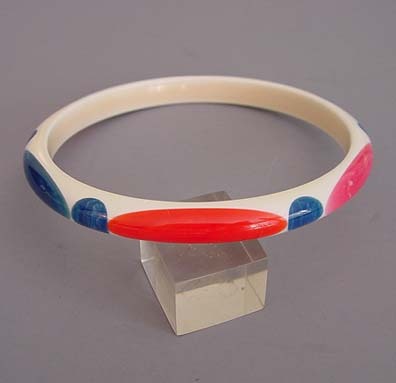 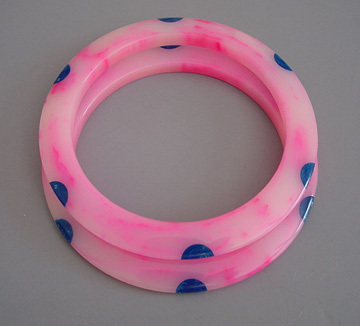 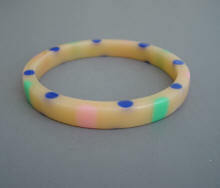 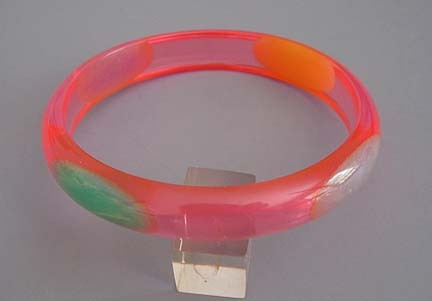 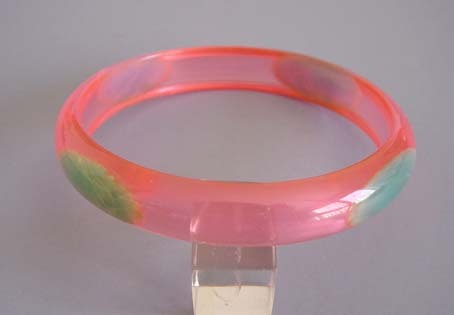 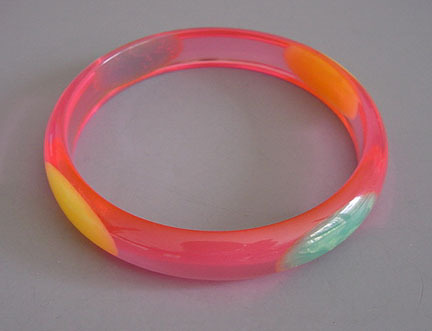 SHULTZ bakelite transparent day glo pink bangle with reverse carved and painted blue slashes, 2-1/2" by 1/2" by 1/4". Stack #B65474. 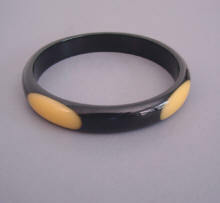 SHULTZ bakelite apple juice bangle with deep purple reverse carved and painted cross hatches that look almost black through the front, 2-1/2". 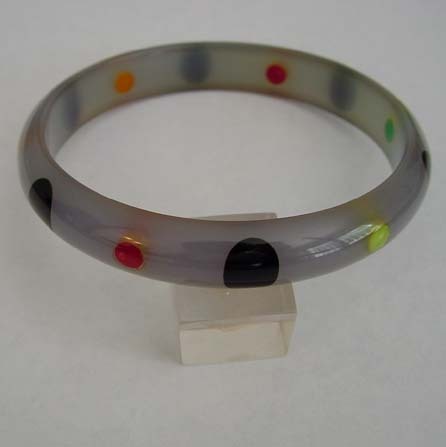 #B65524. 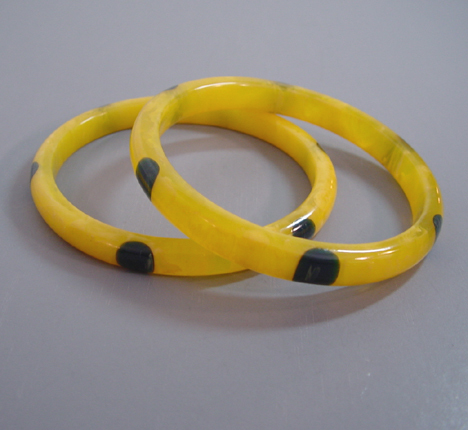 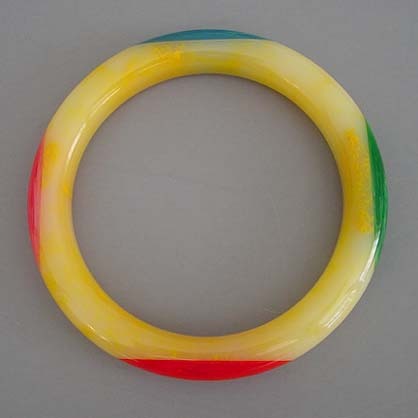 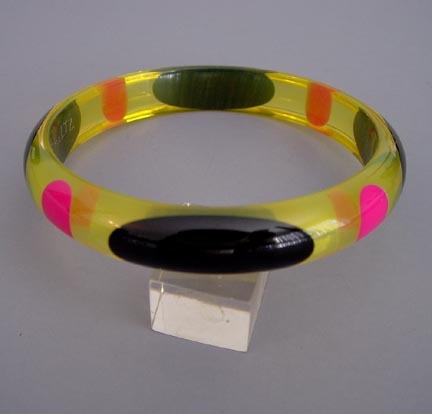 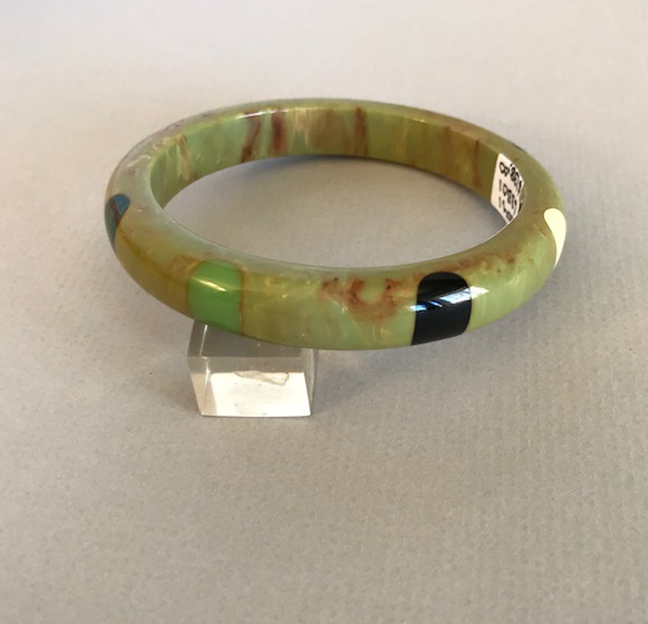 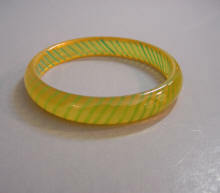 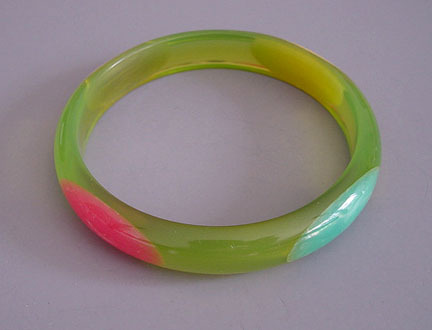 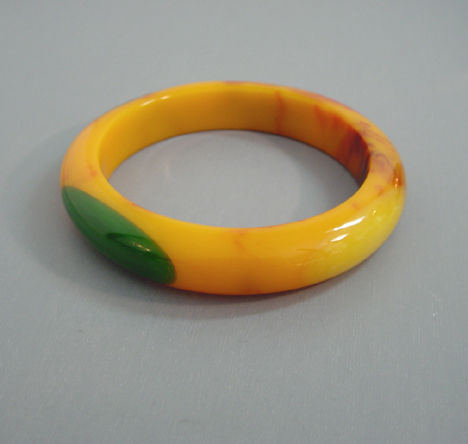 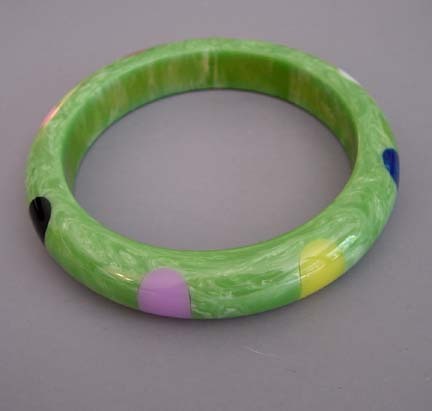 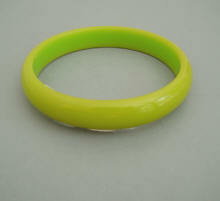 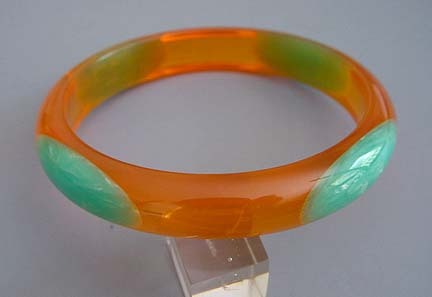 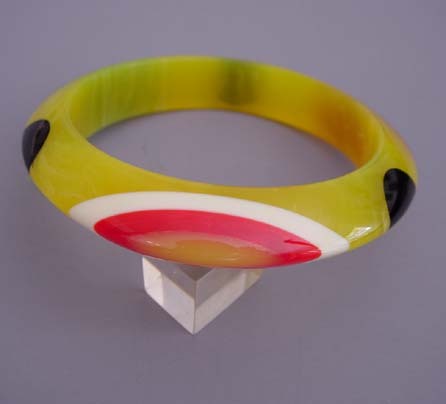 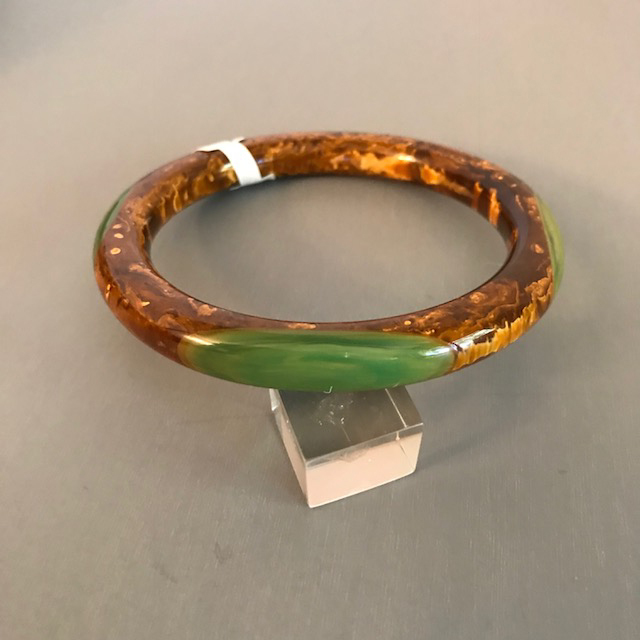 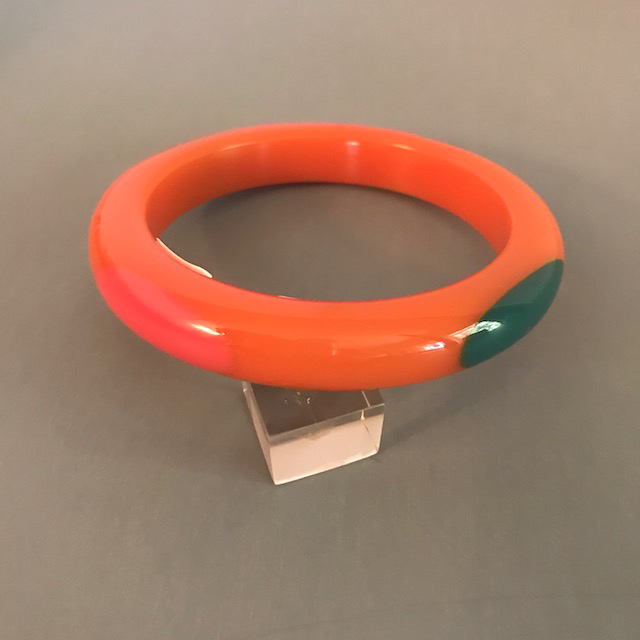 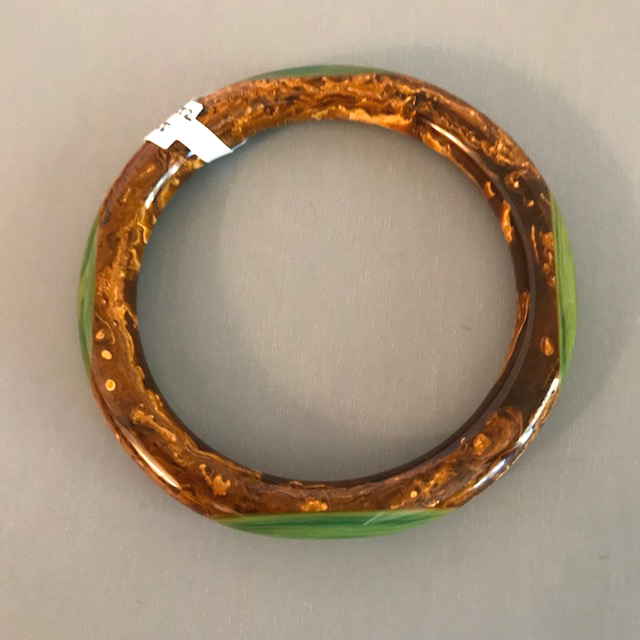 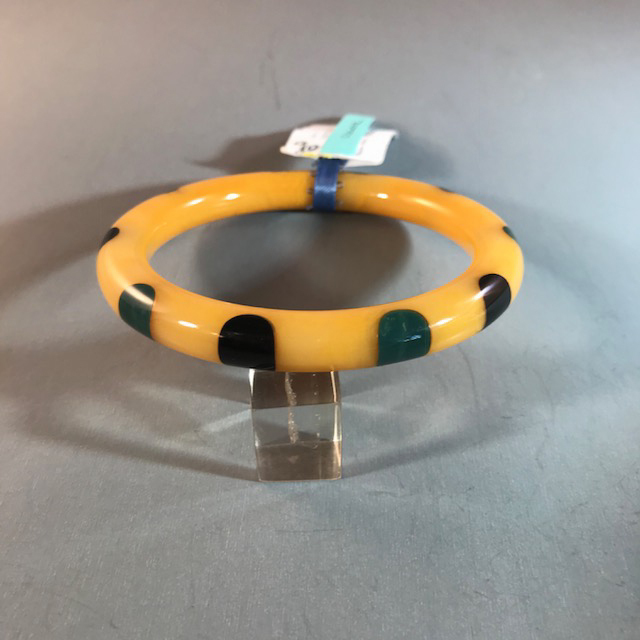 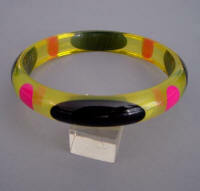 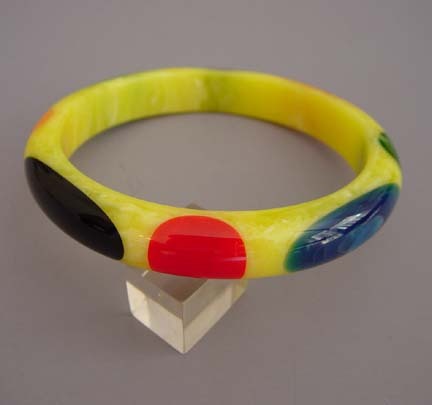 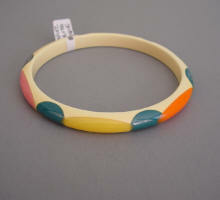 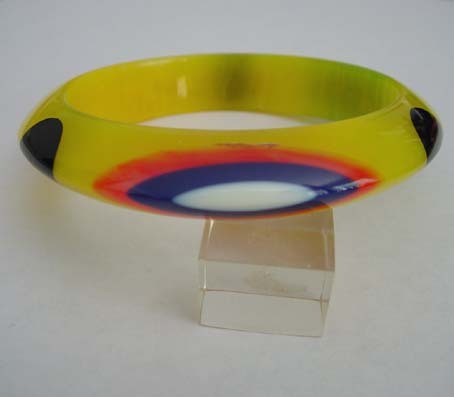 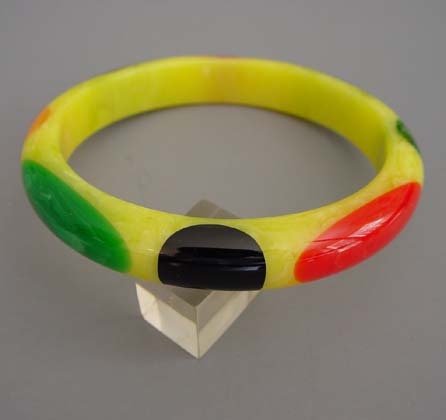 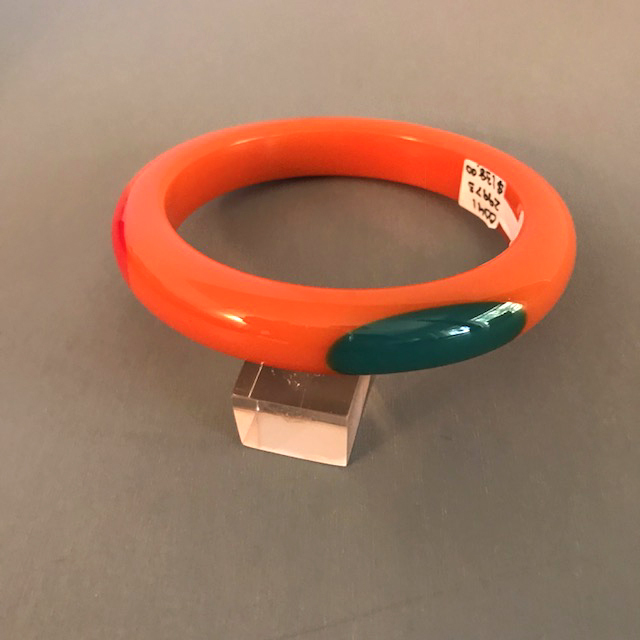 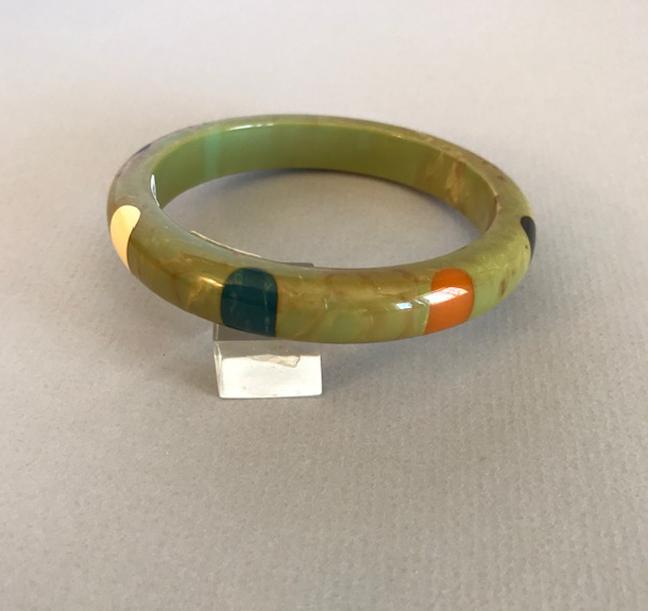 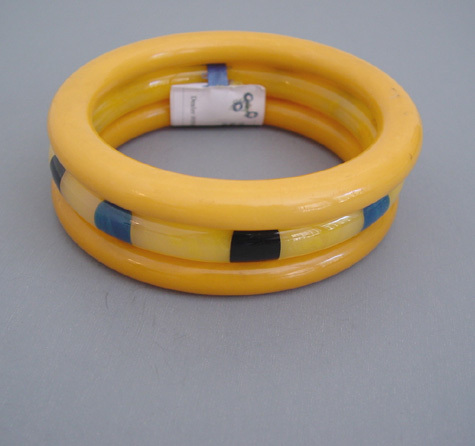 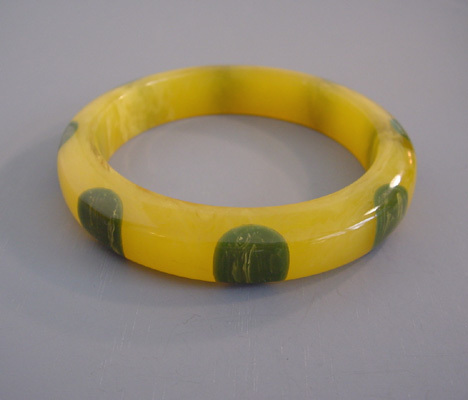 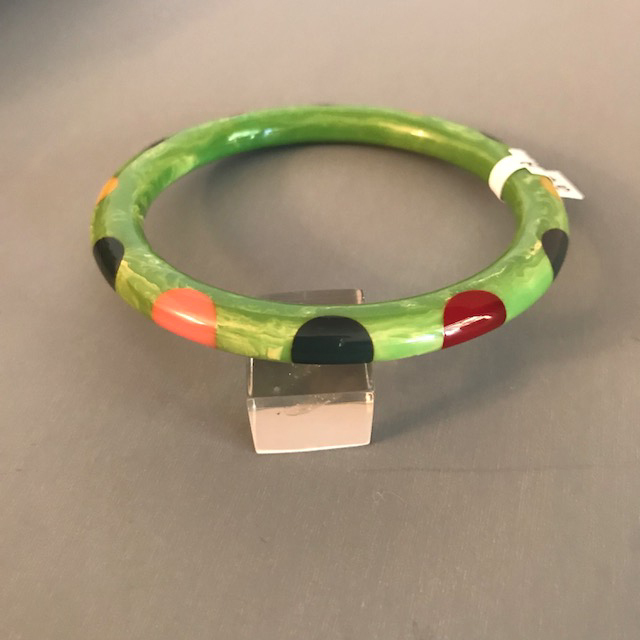 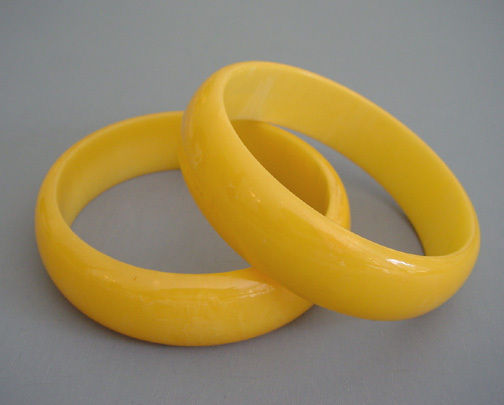 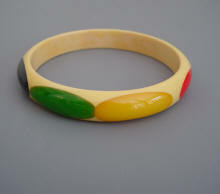 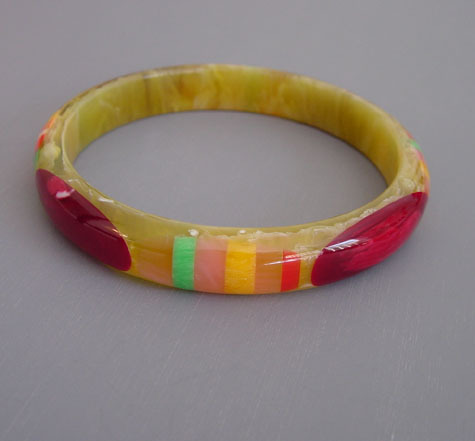 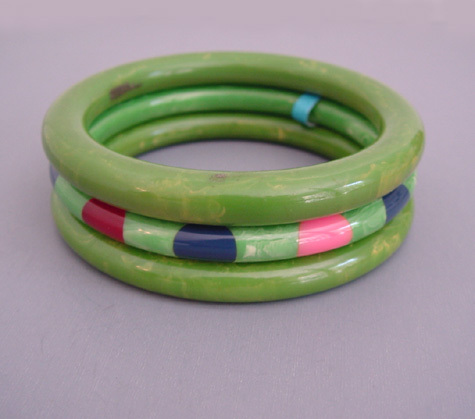 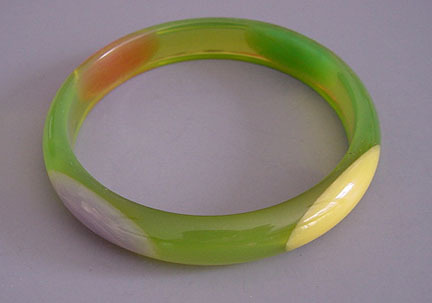 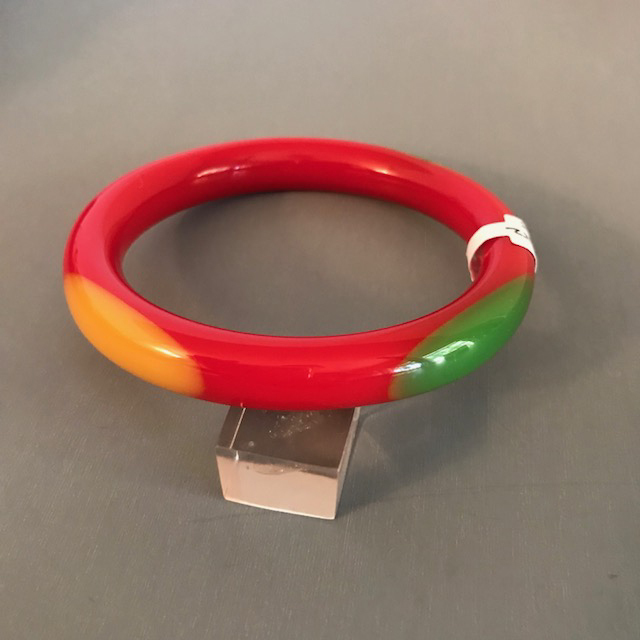 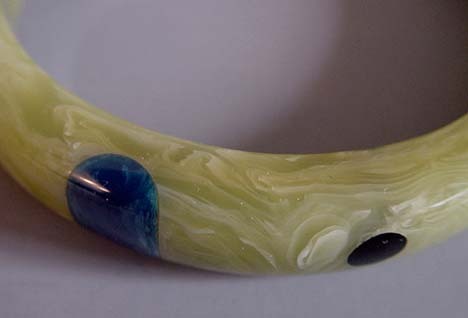 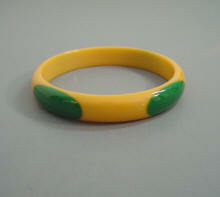 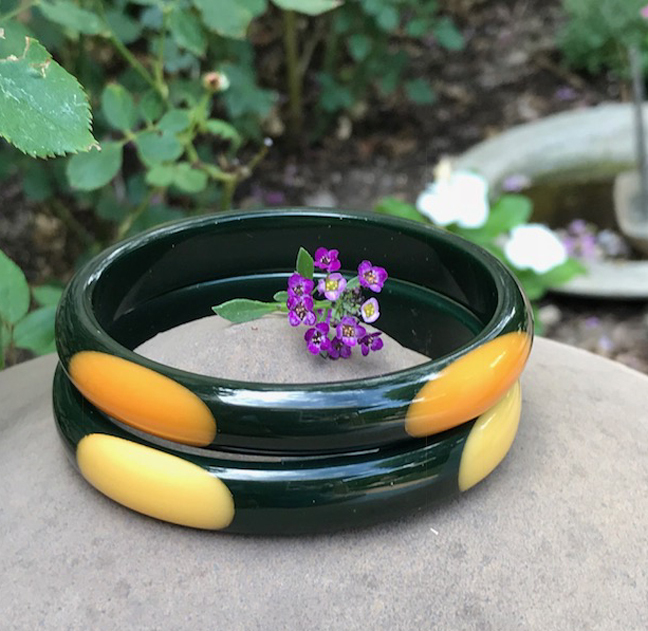 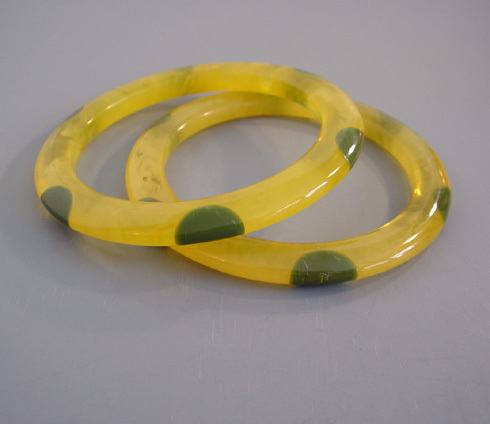 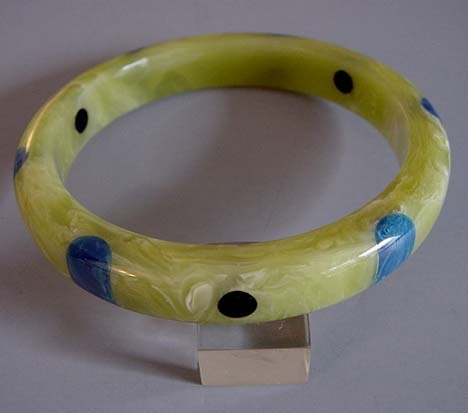 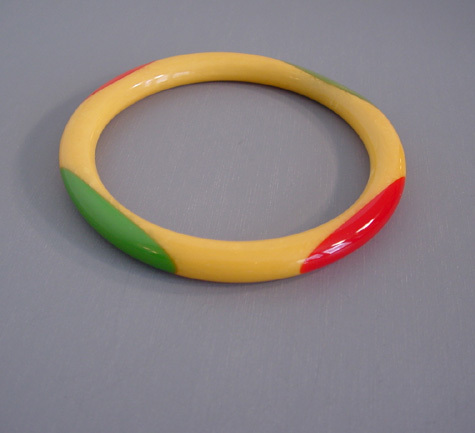 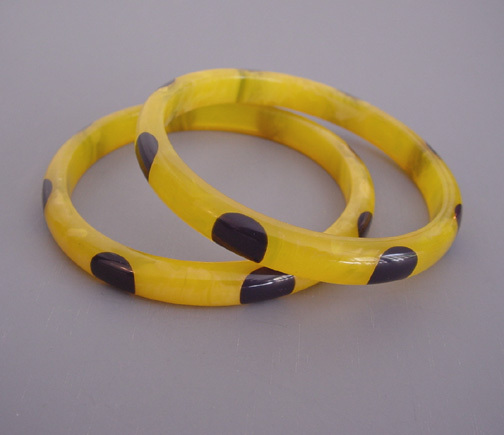 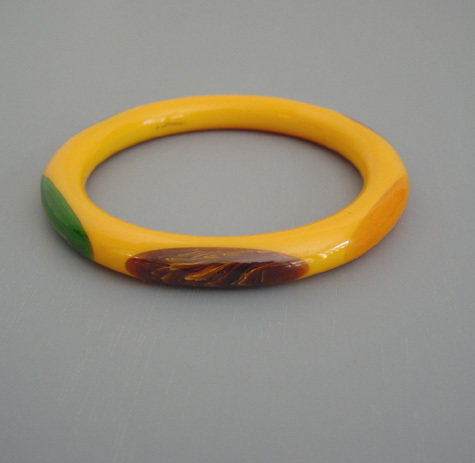 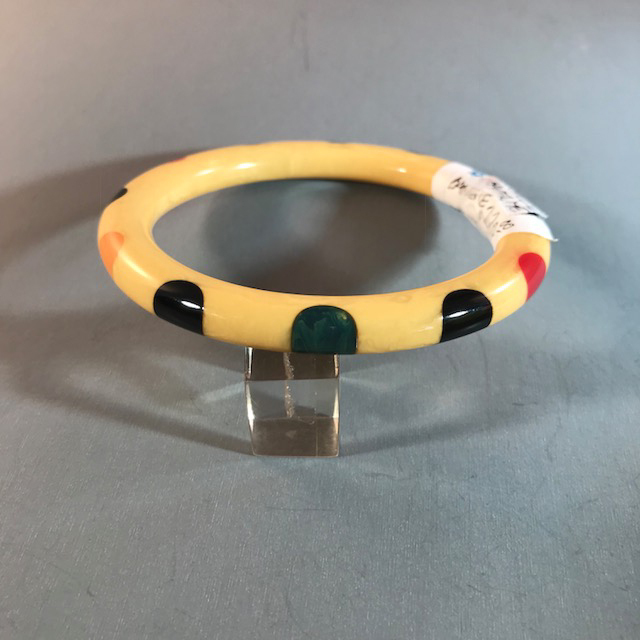 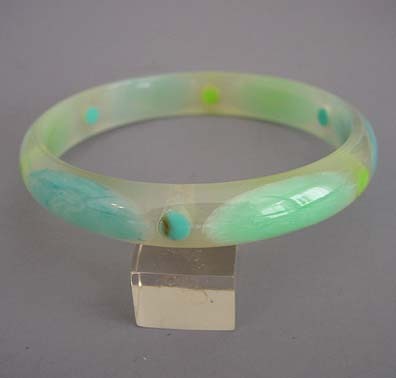 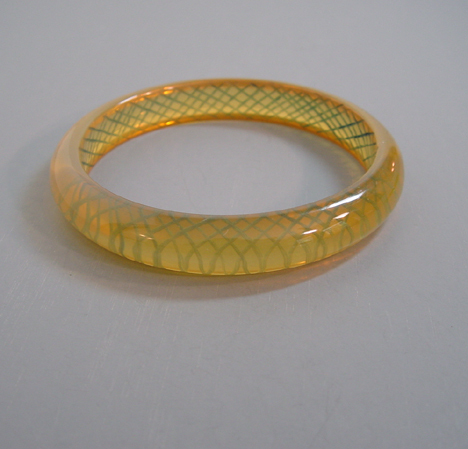 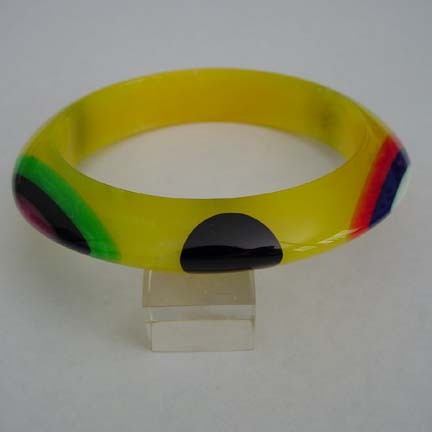 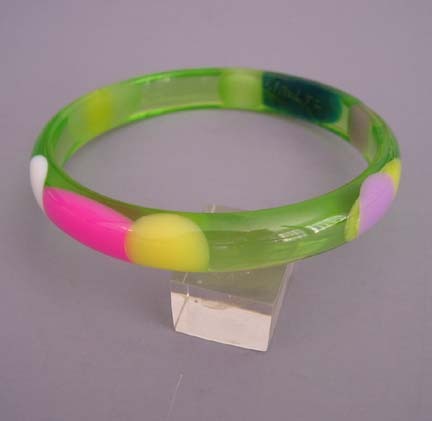 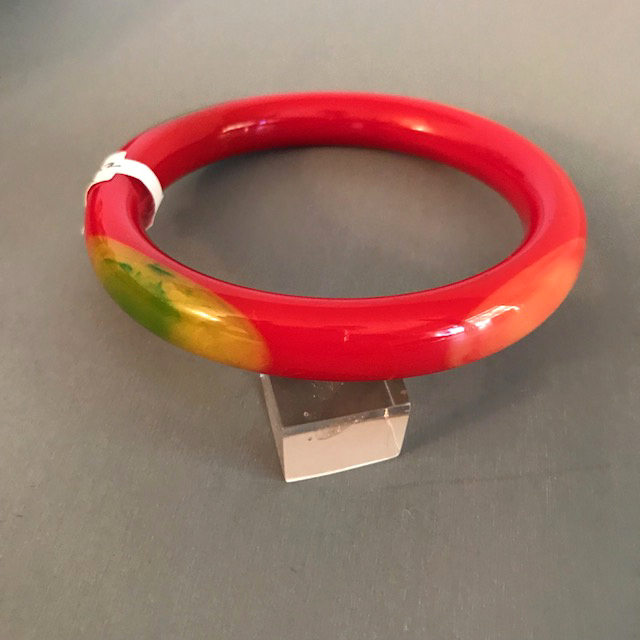 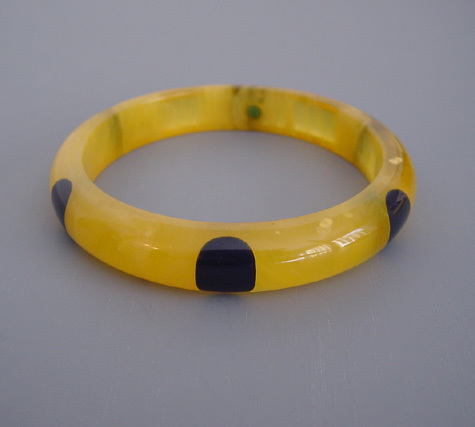 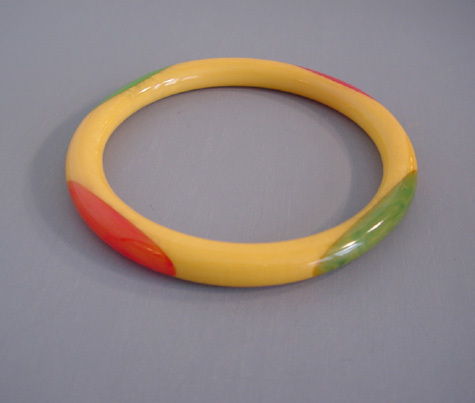 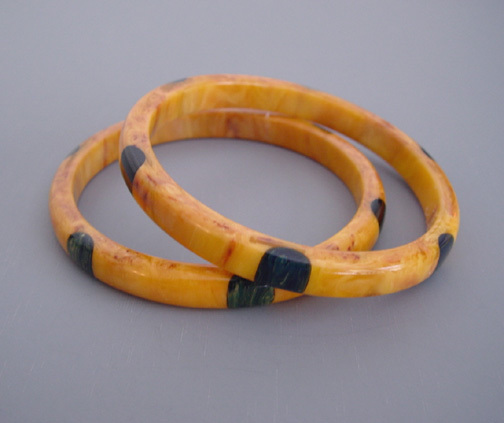 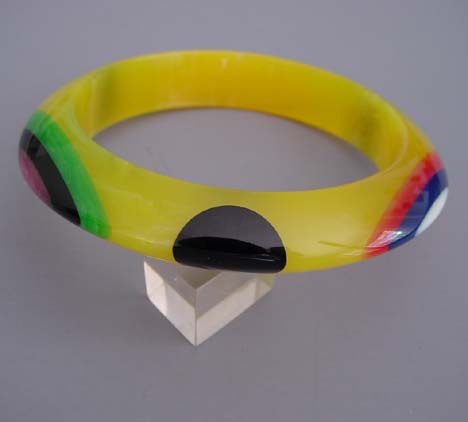 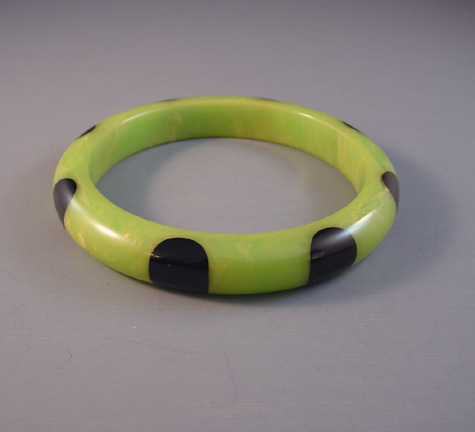 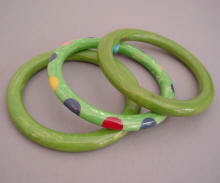 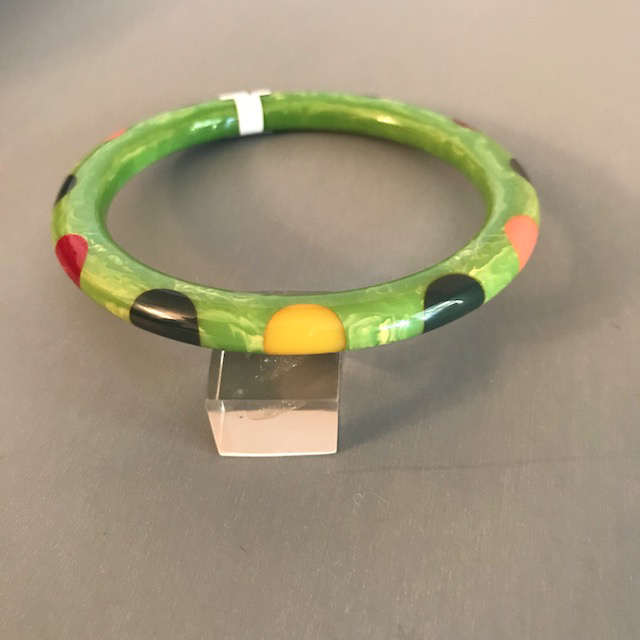 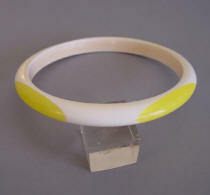 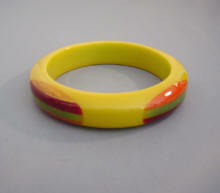 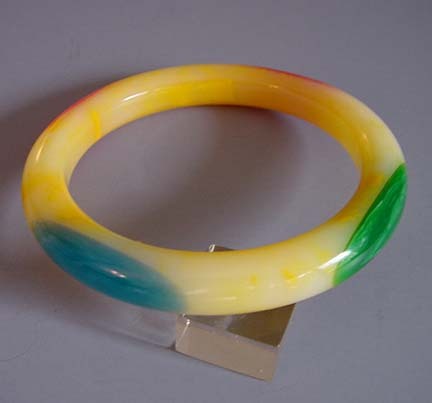 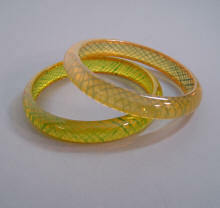 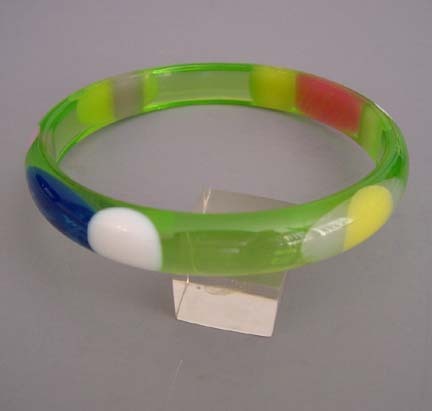 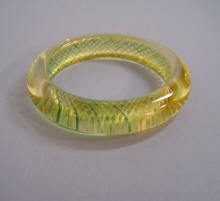 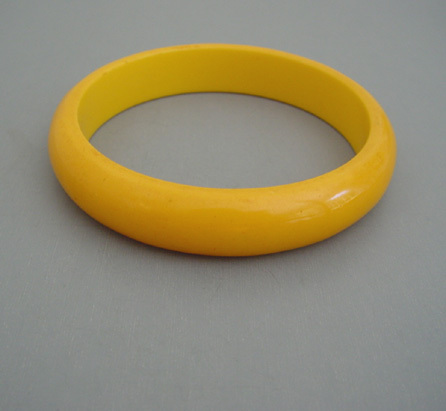 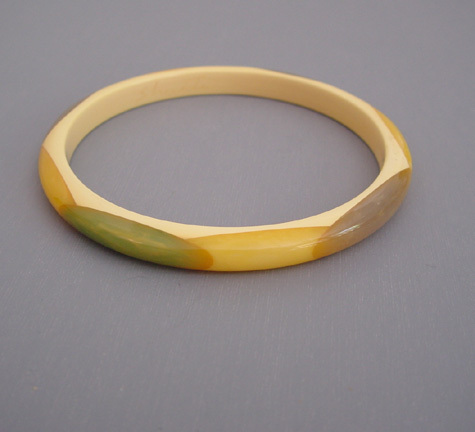 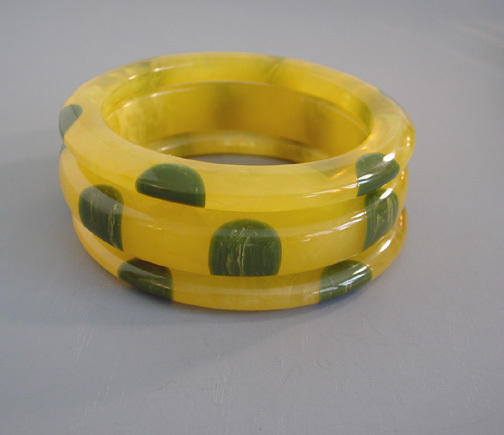 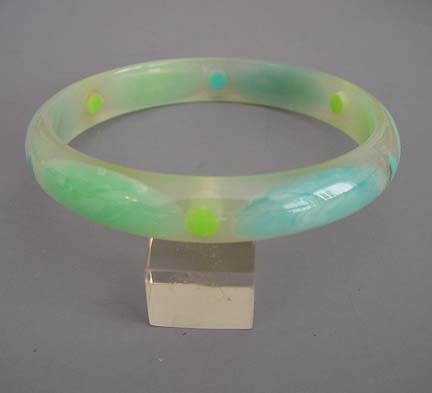 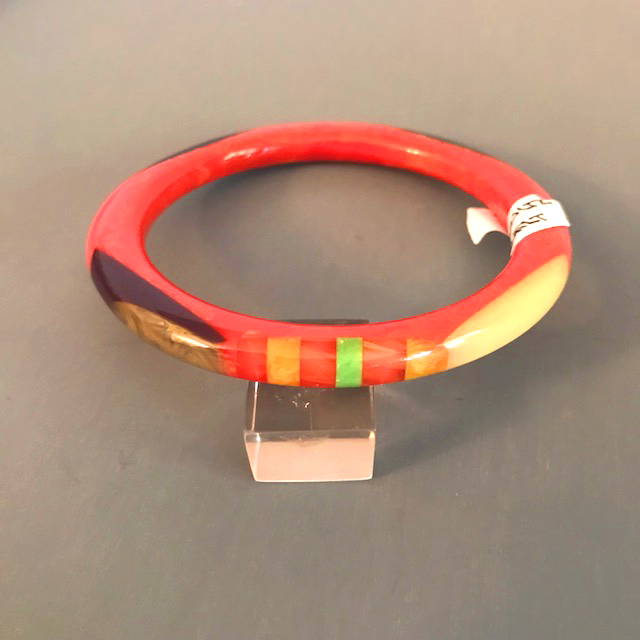 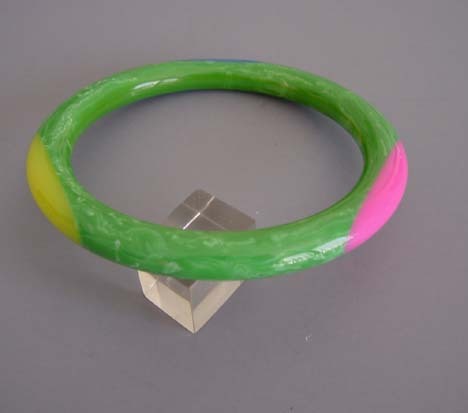 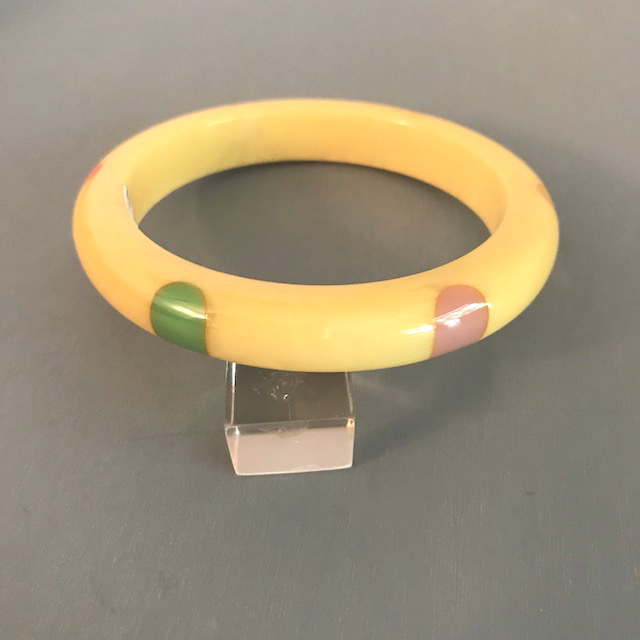 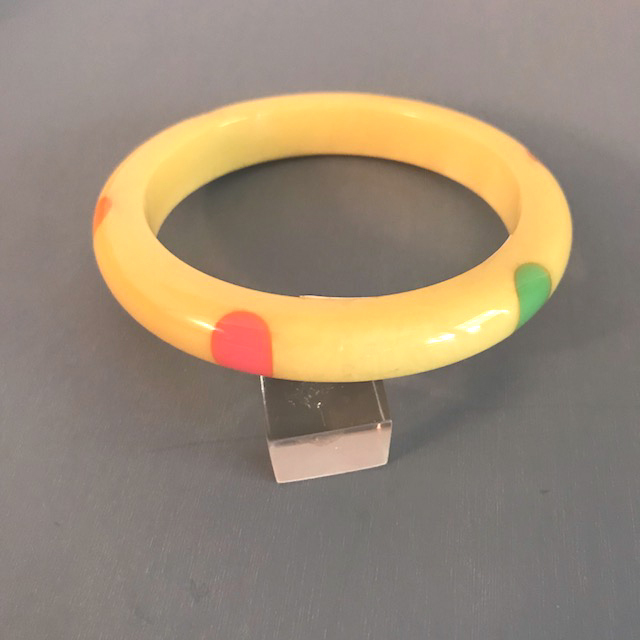 SHULTZ bakelite rare transparent yellow spacer bangle with reverse carved and painted green slashes, 2-1/2" by 1/2" by 1/4". 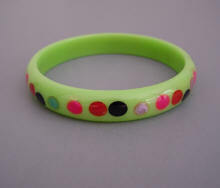 #B64951. 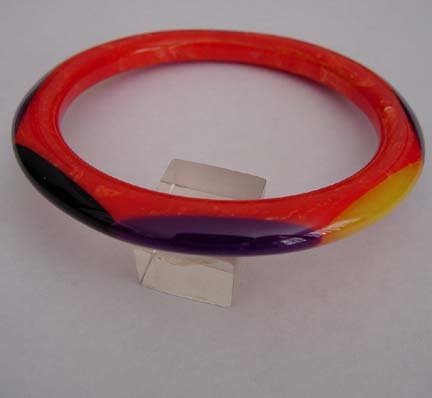 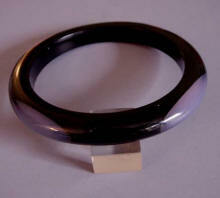 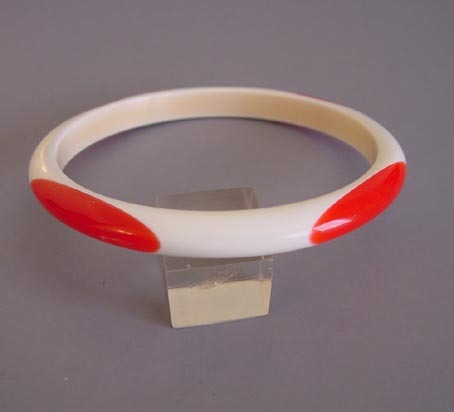 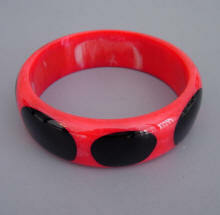 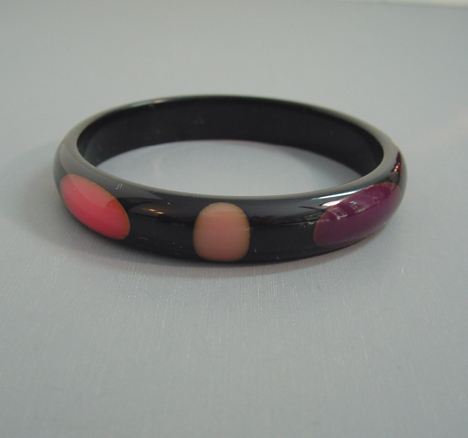 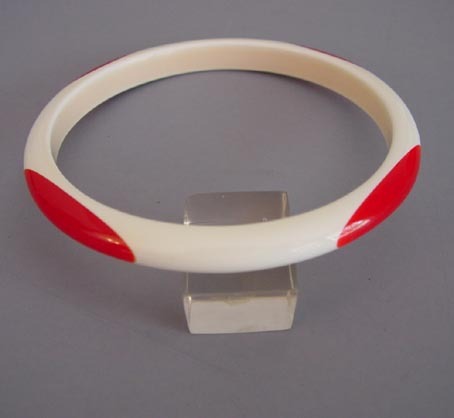 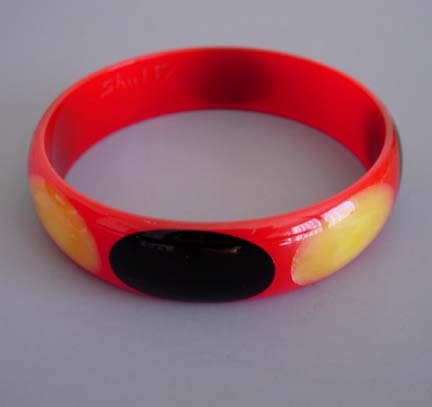 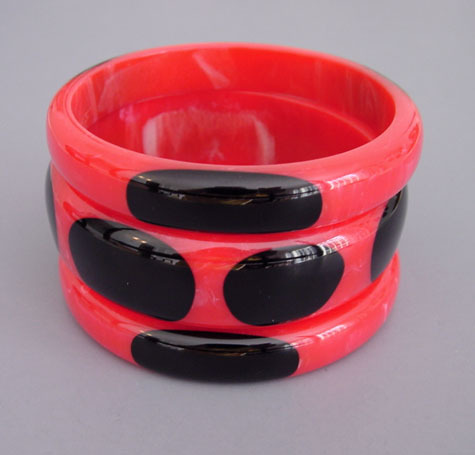 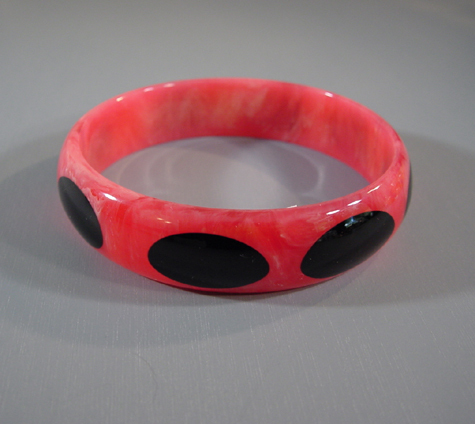 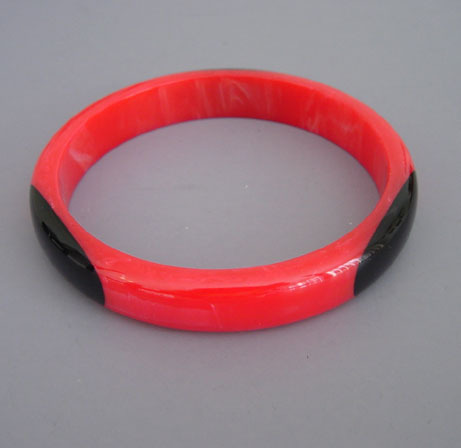 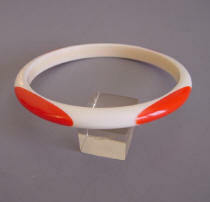 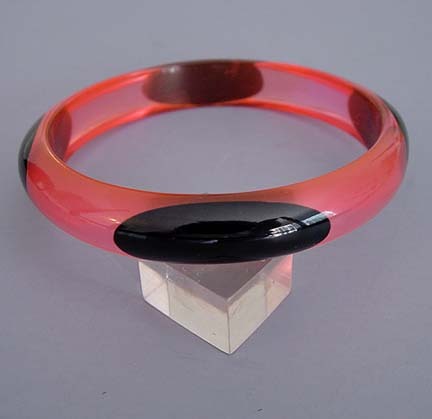 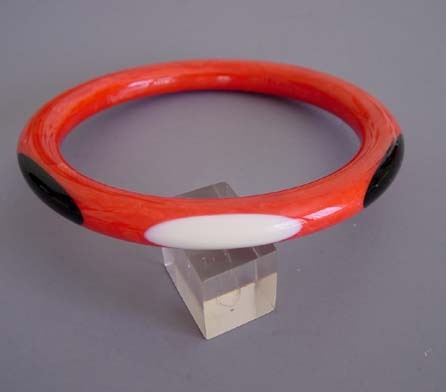 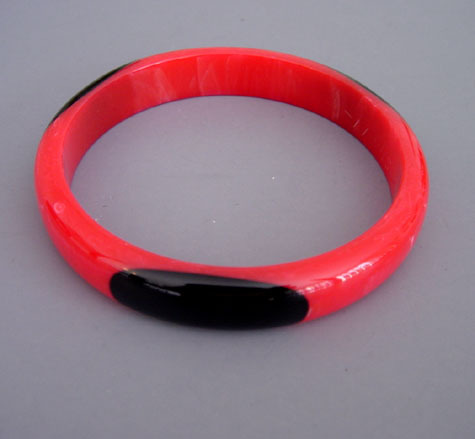 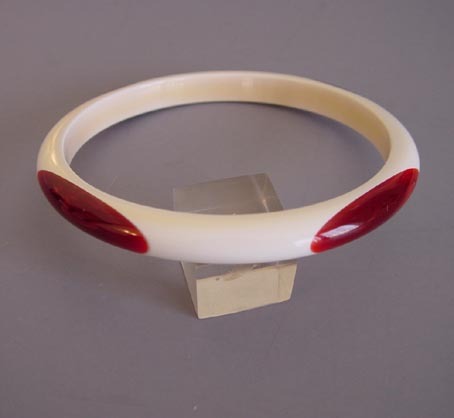 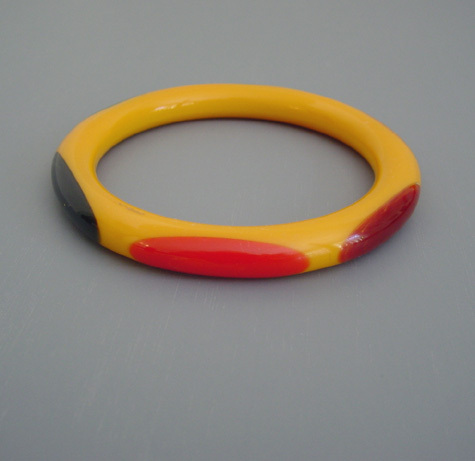 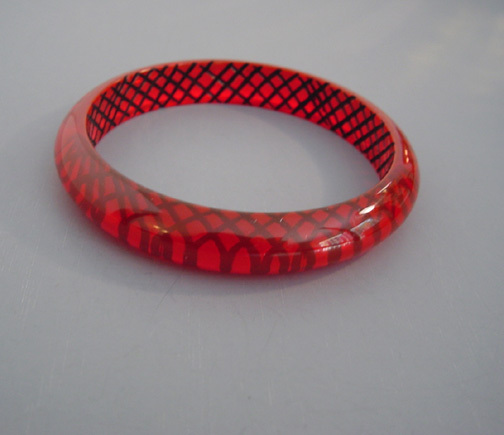 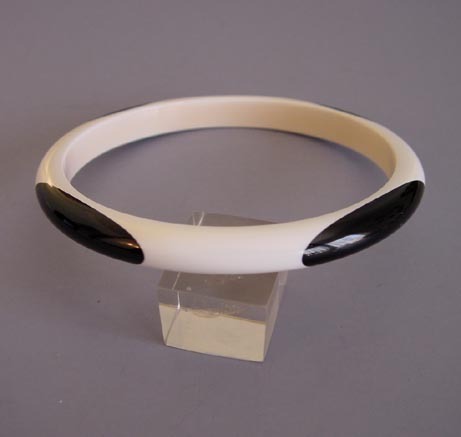 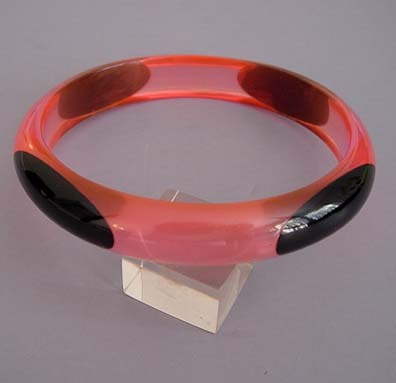 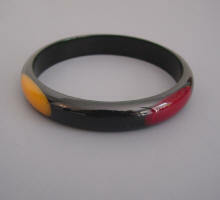 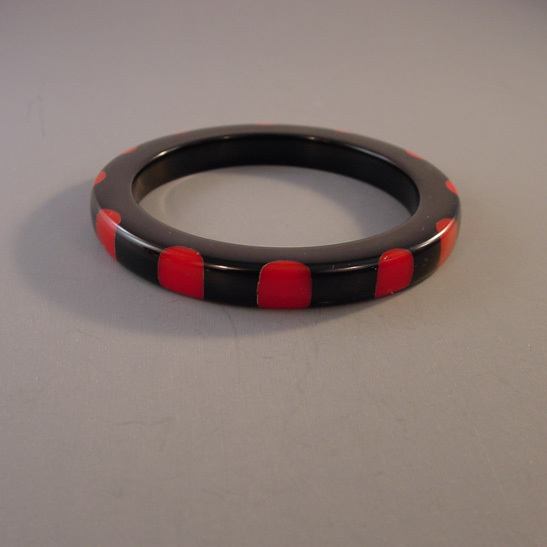 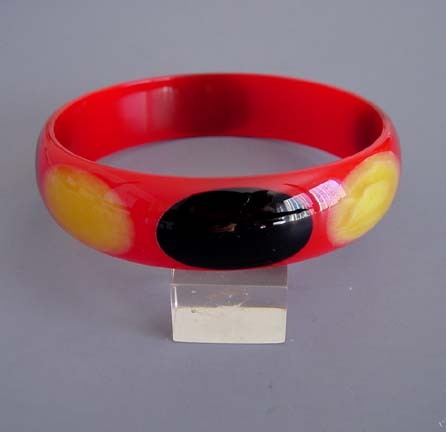 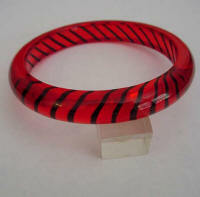 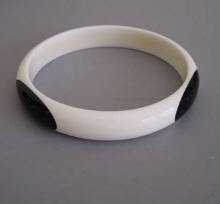 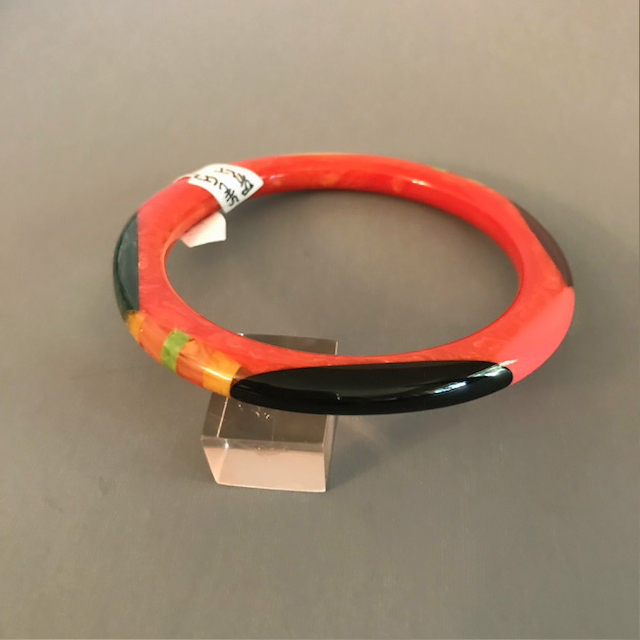 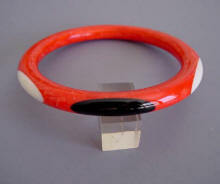 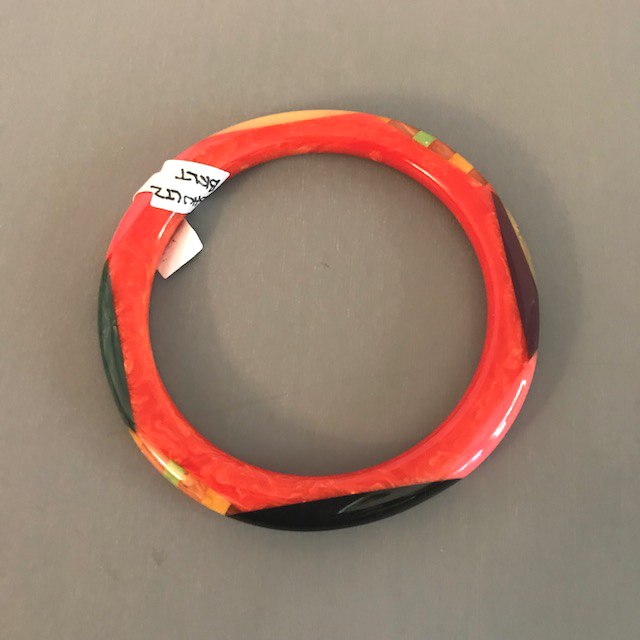 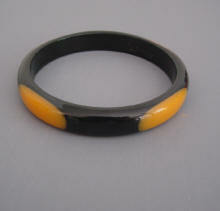 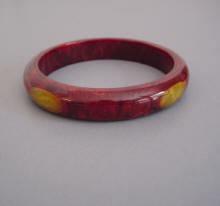 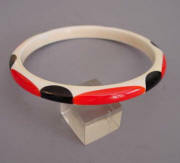 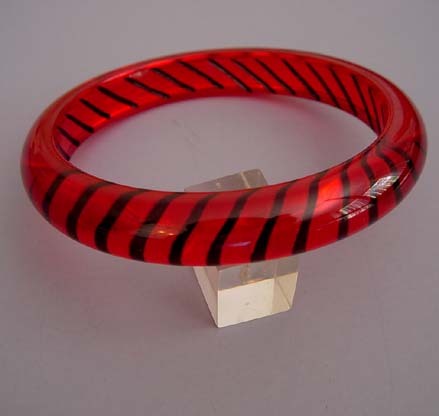 SHULTZ bakelite red transparent bangle with reverse carved black slashes, 2-1/2" by 1/2" by 1/3". #B31404. 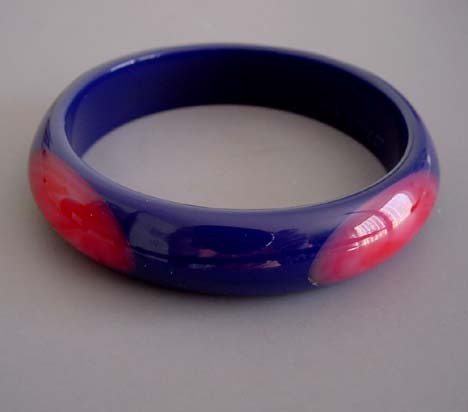 SHULTZ bakelite red glow transparent spacer bangle with blue reverse carved and painted cross hatching, 2-1/2" by 1/2" by 1/3". 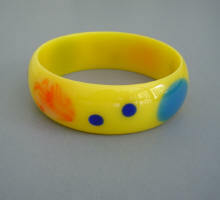 #B64344. 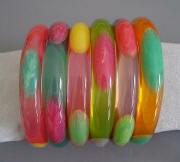 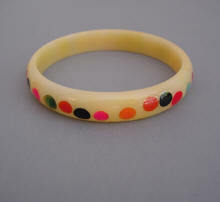 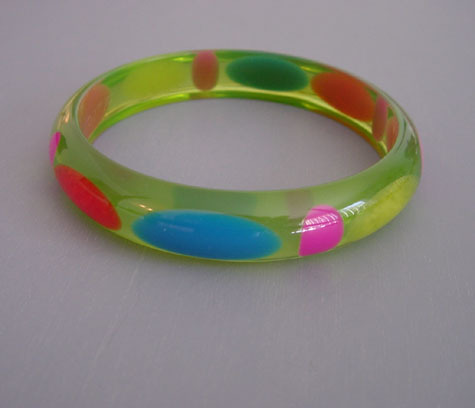 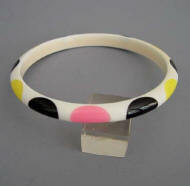 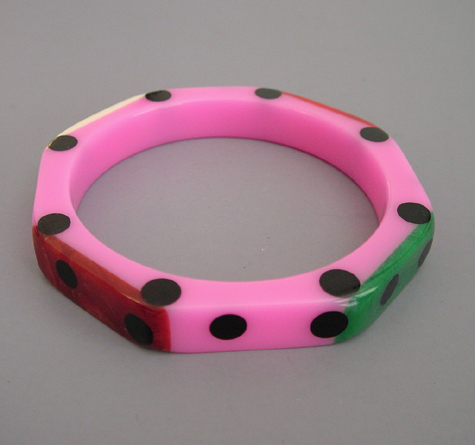 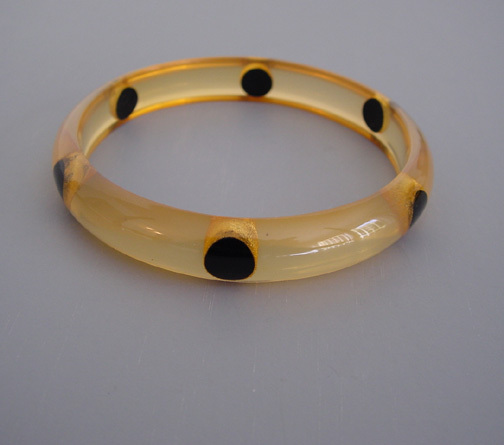 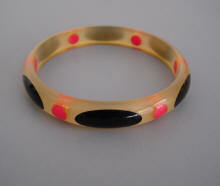 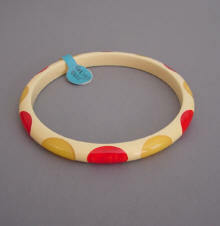 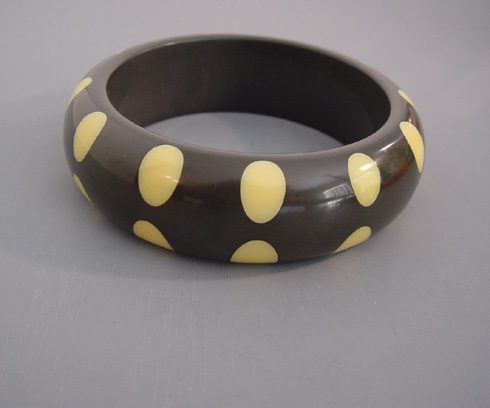 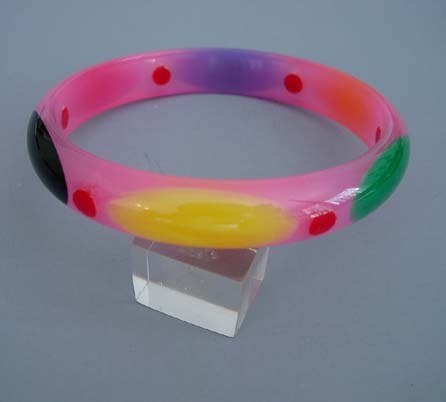 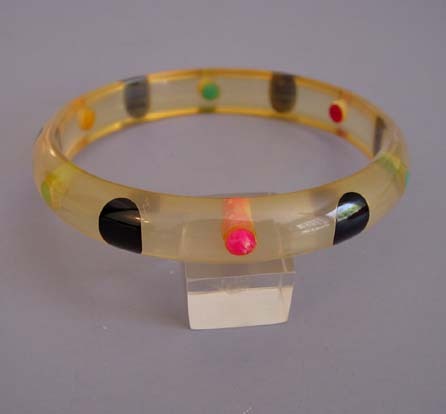 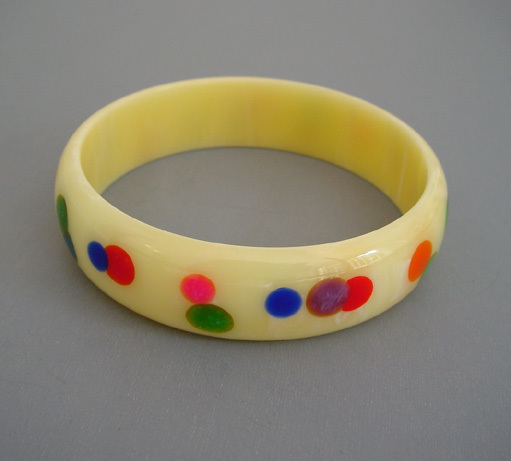 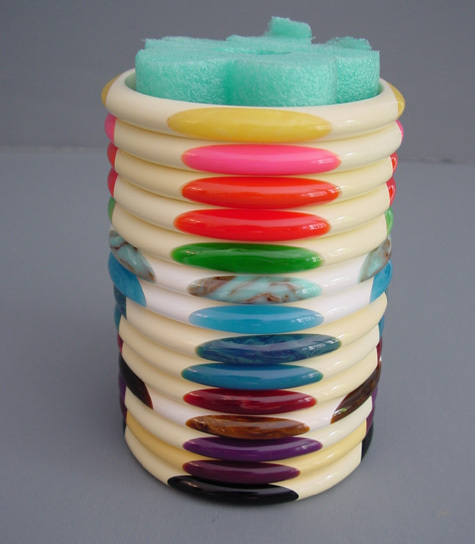 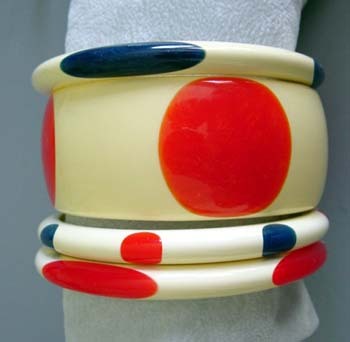 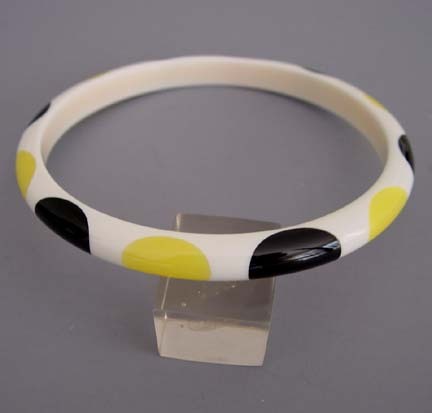 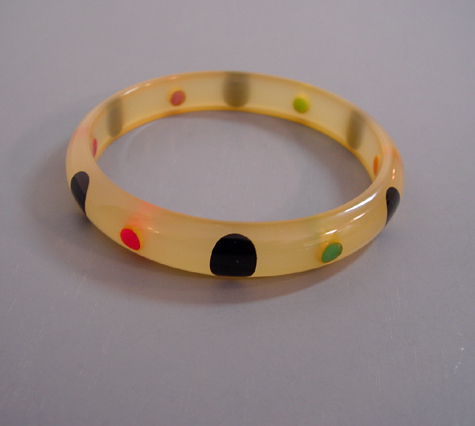 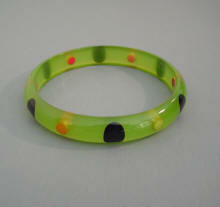 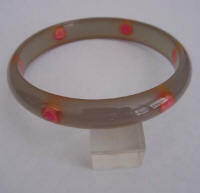 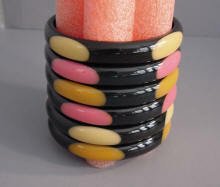 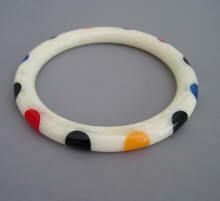 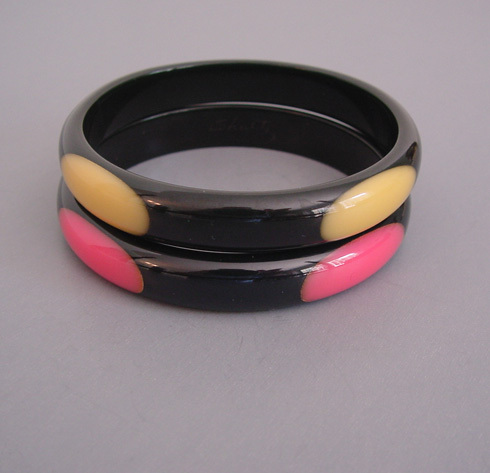 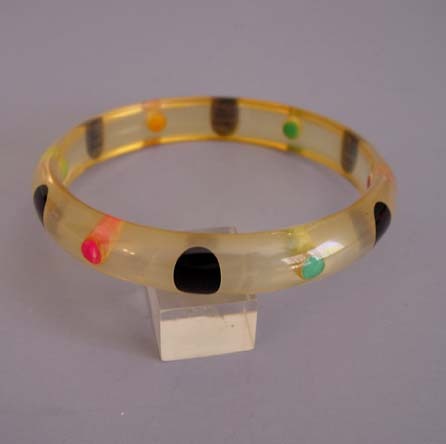 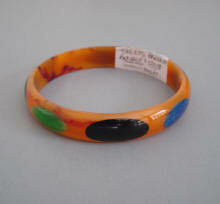 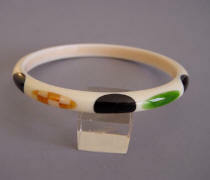 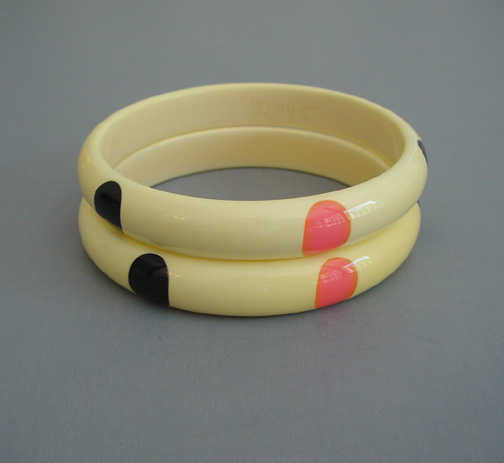 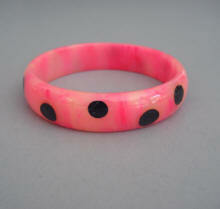 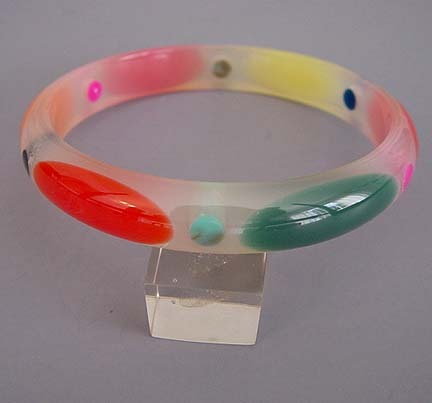 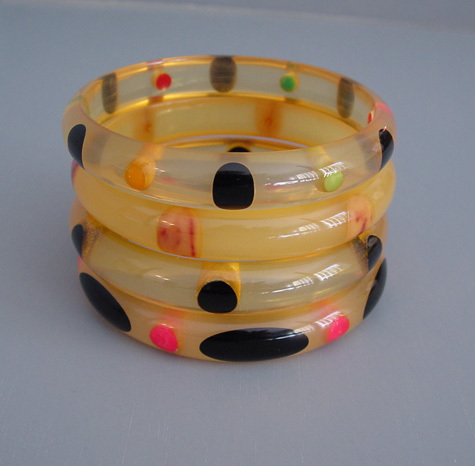 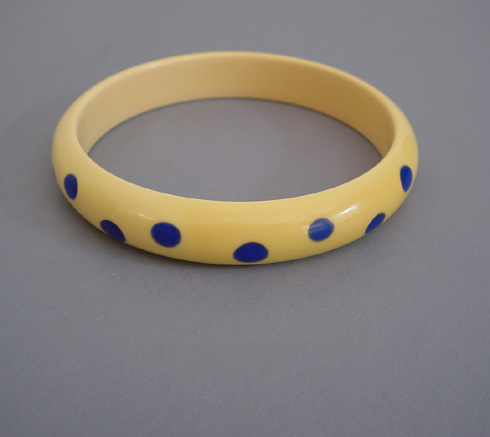 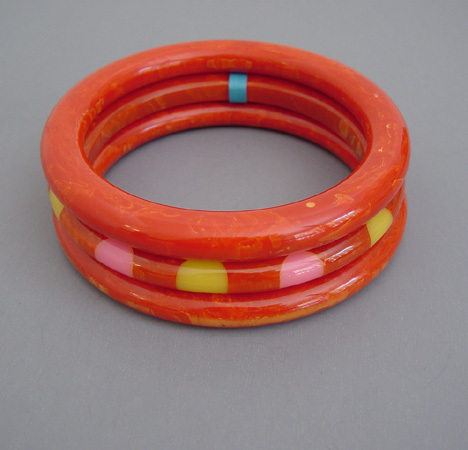 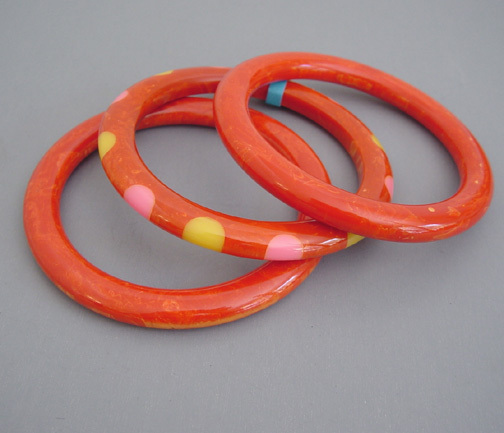 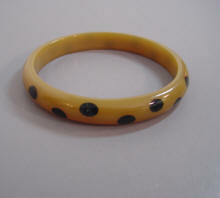 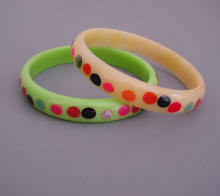 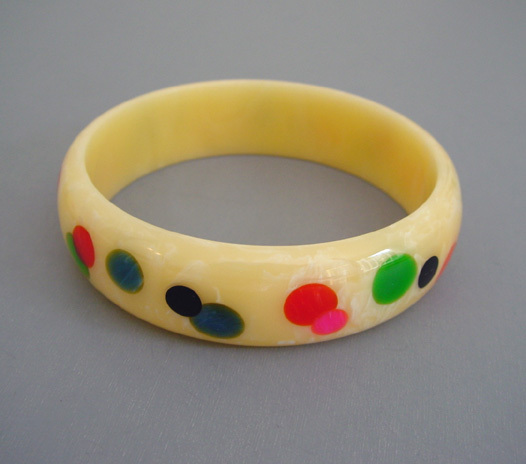 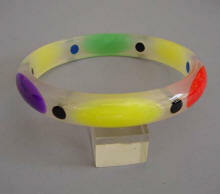 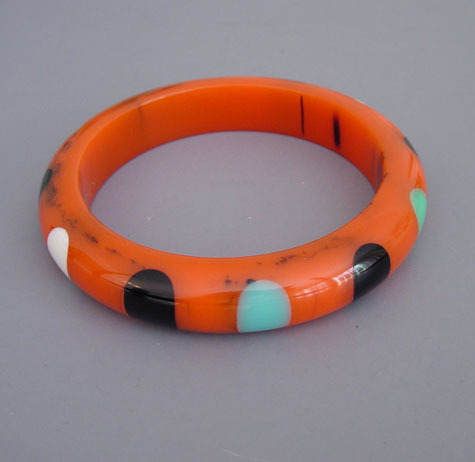 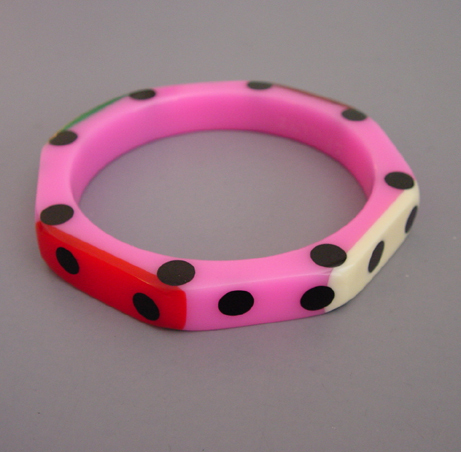 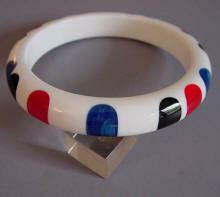 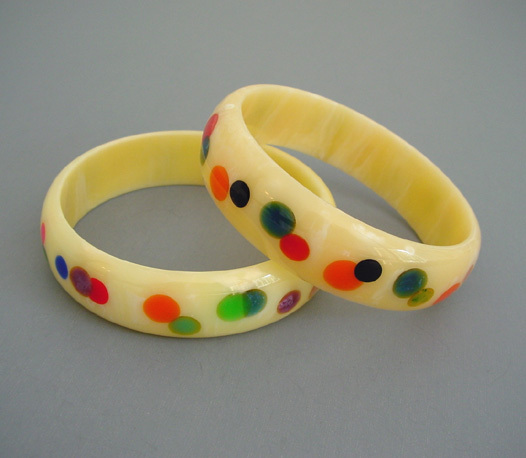 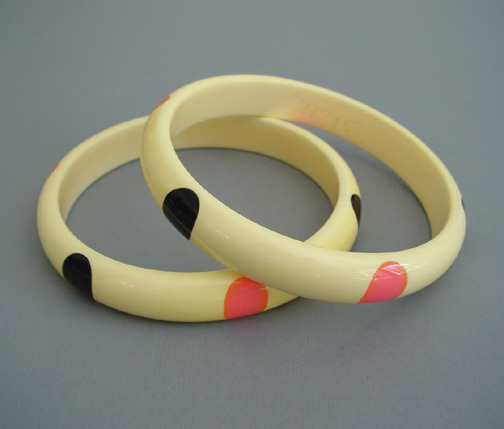 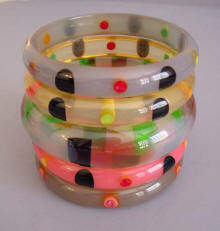 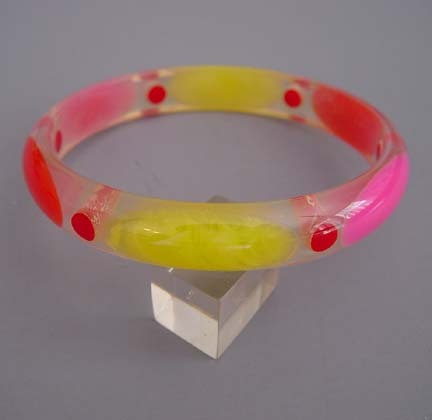 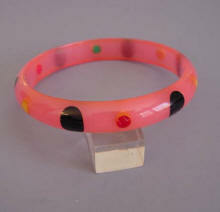 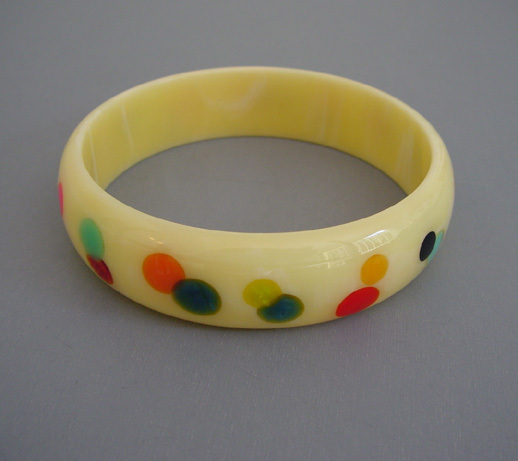 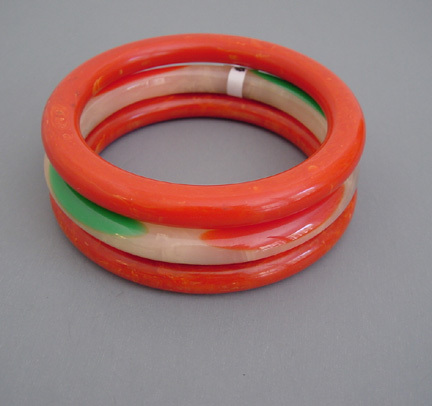 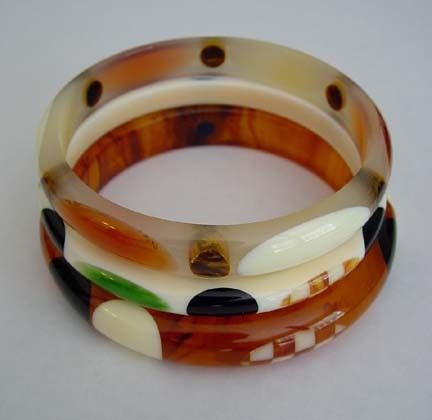 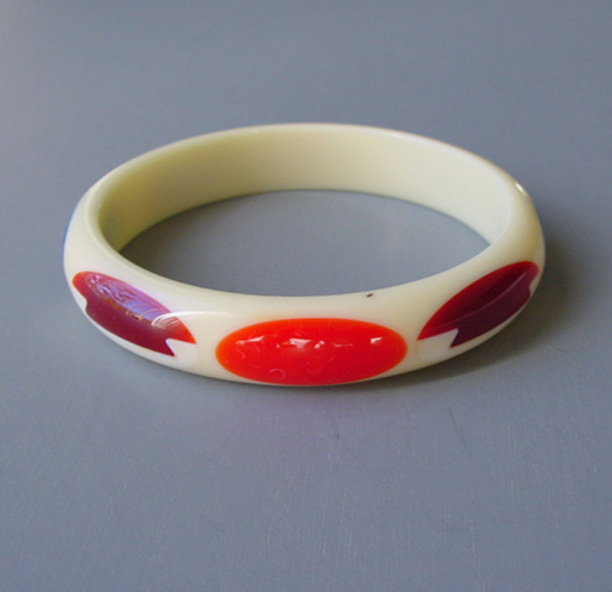 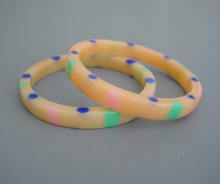 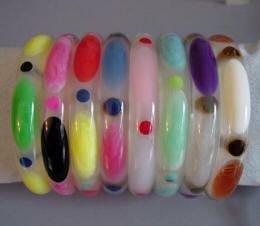 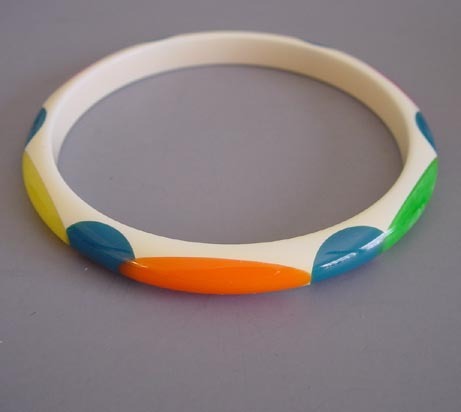 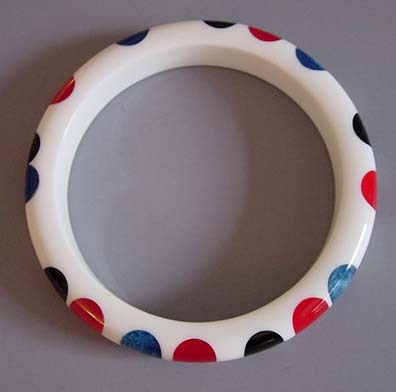 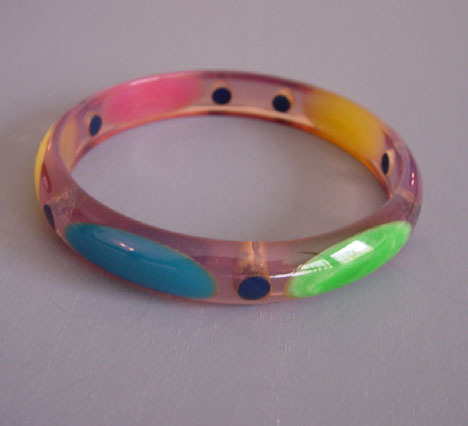 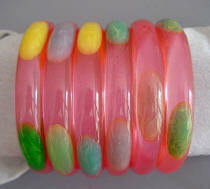 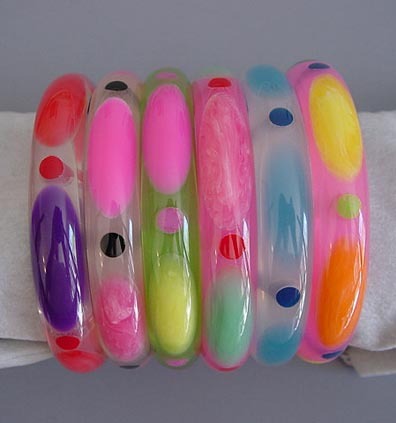 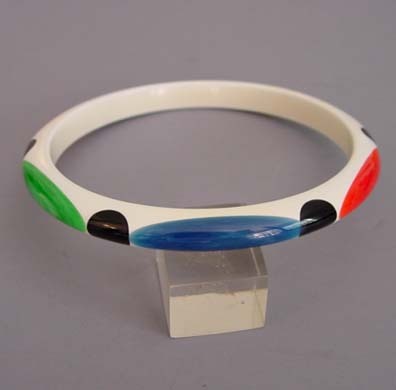 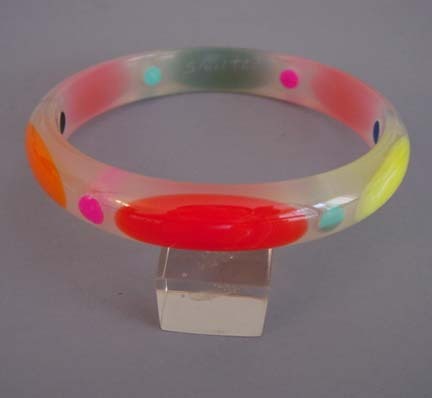 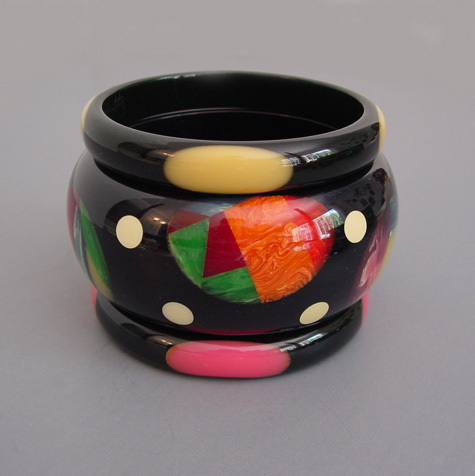 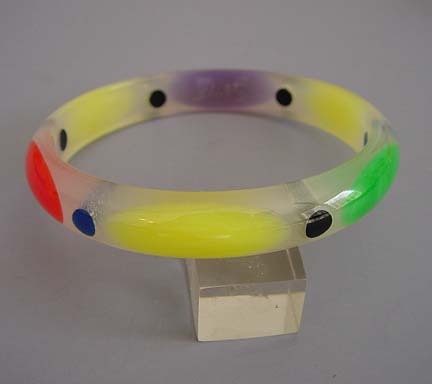 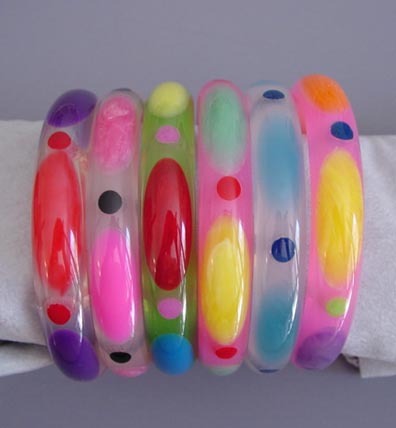 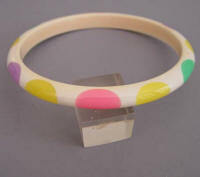 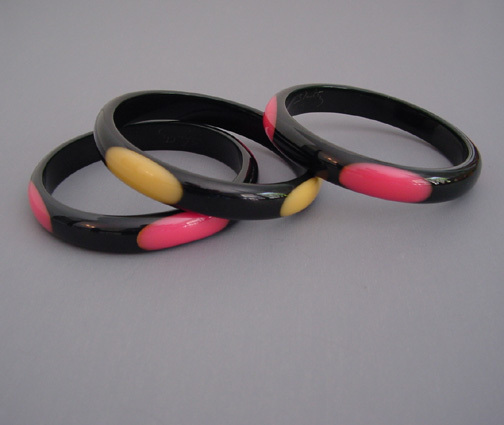 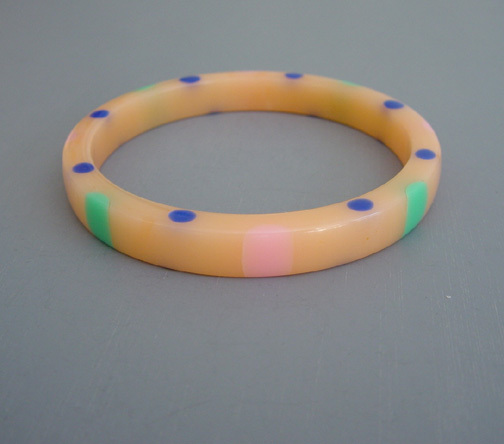 SHULTZ stack of bakelite translucent cloud and dots bangles. 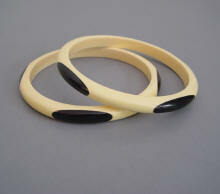 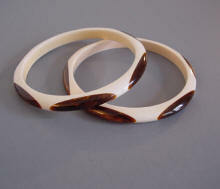 SHULTZ stack of bakelite caramel and cream bangles. 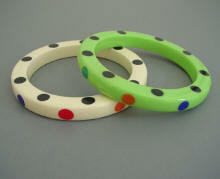 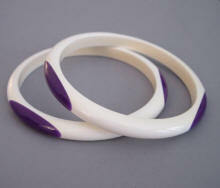 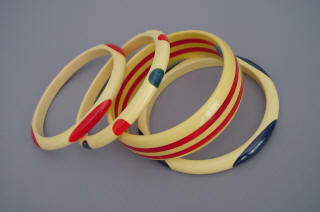 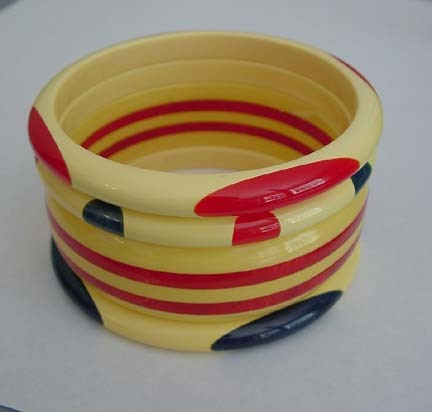 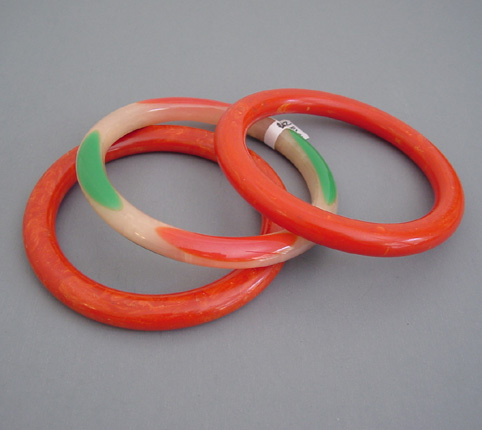 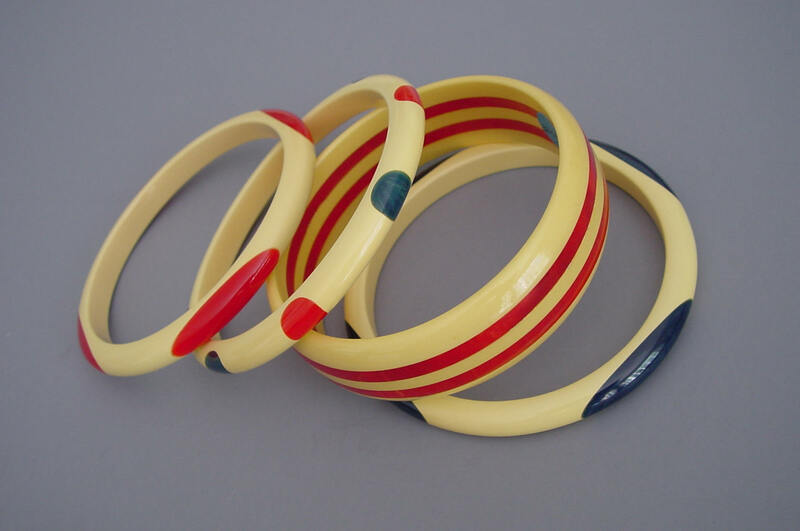 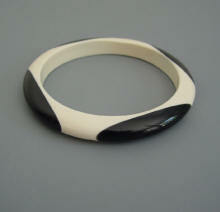 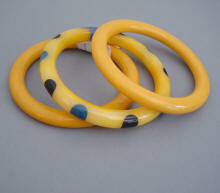 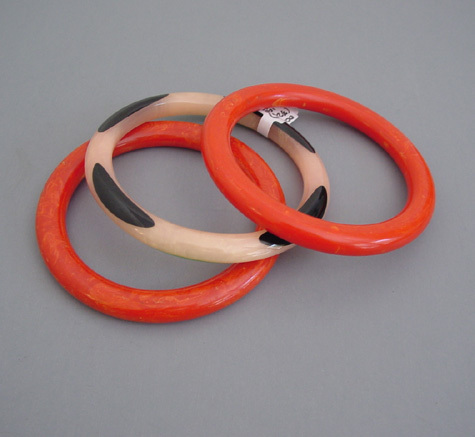 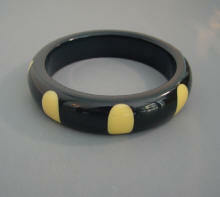 BAKELITE bangles to be dotted. 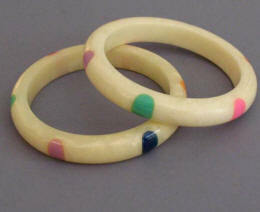 These turned out lovely pastel colors, and then the finished bangles. 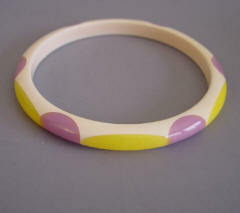 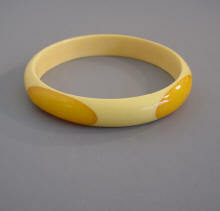 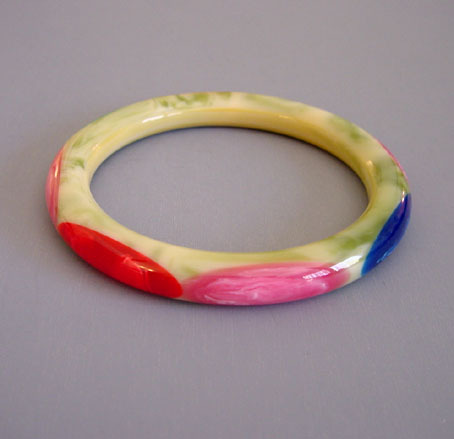 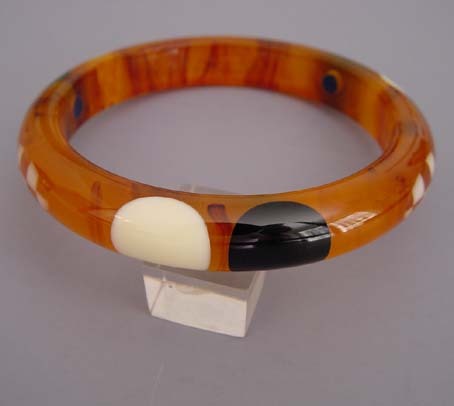 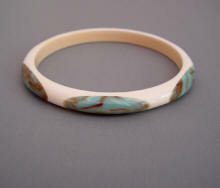 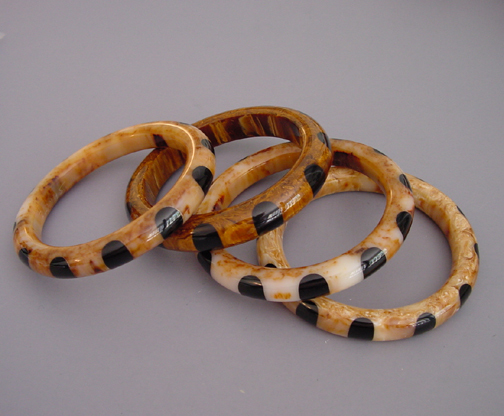 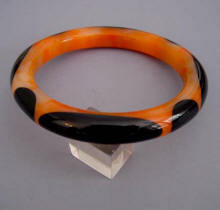 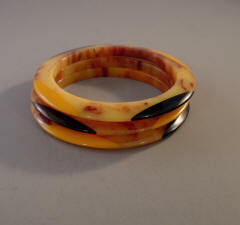 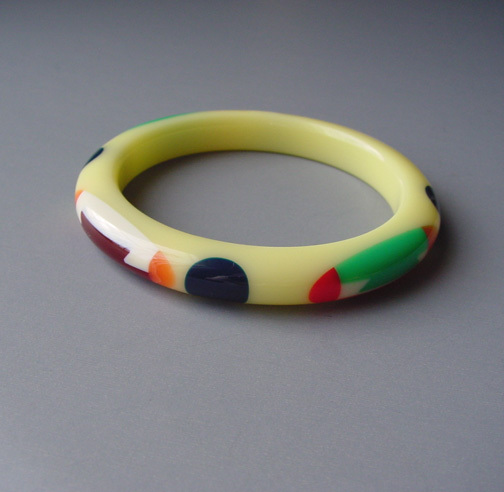 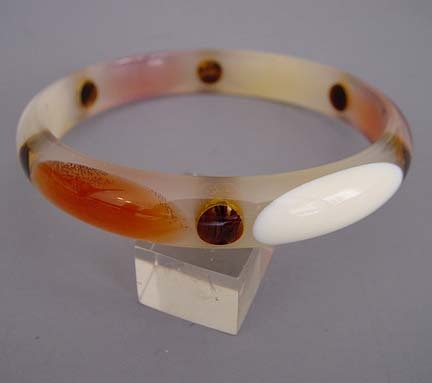 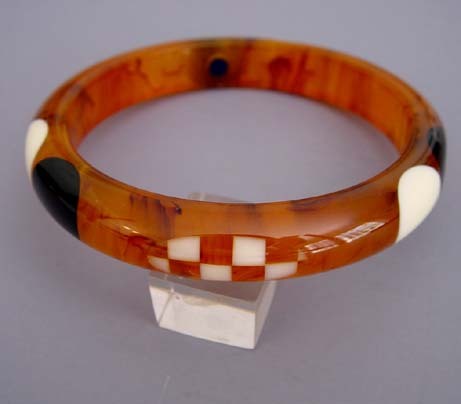 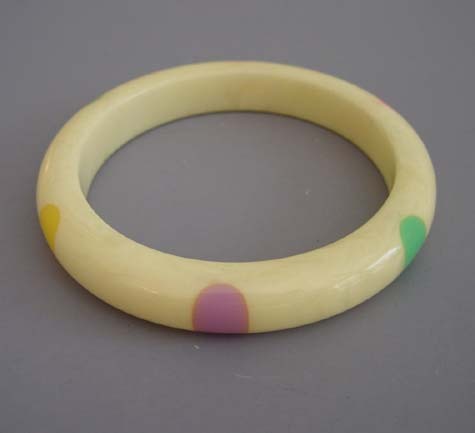 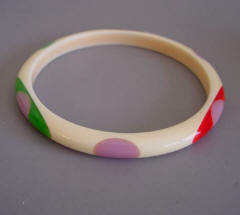 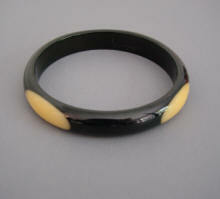 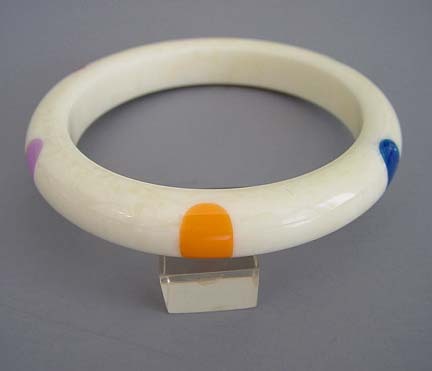 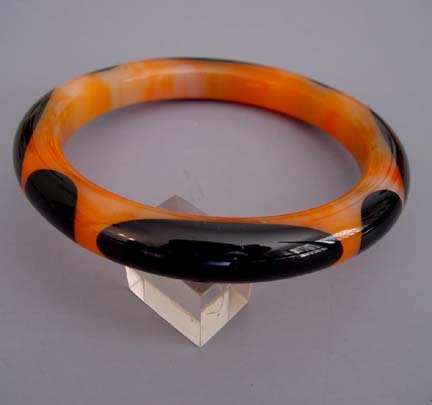 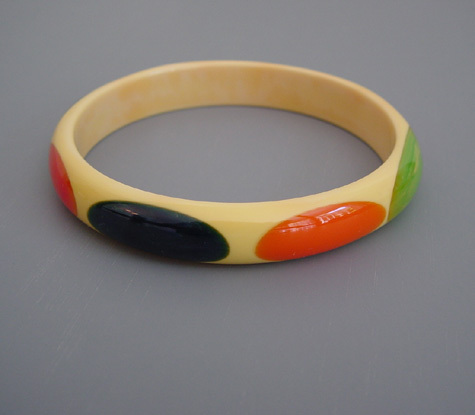 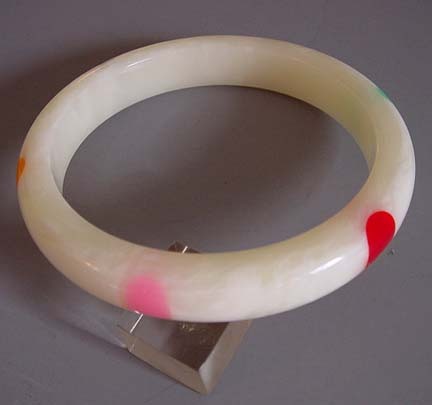 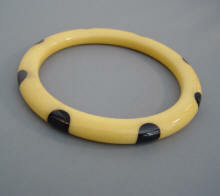 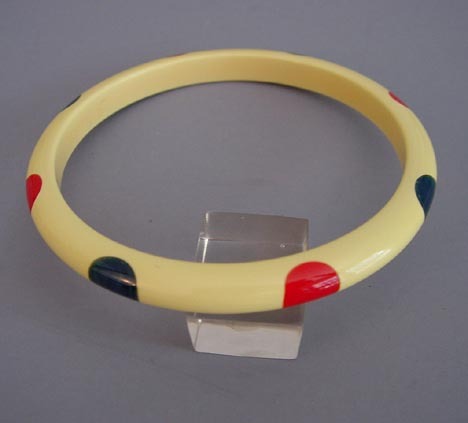 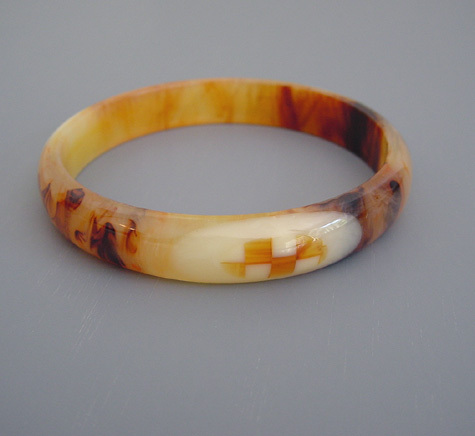 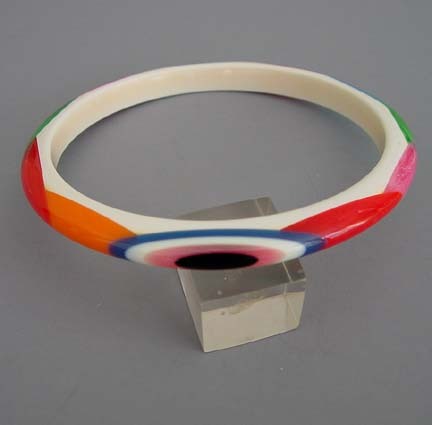 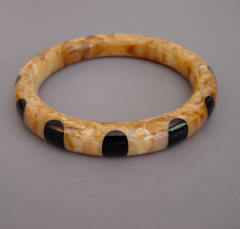 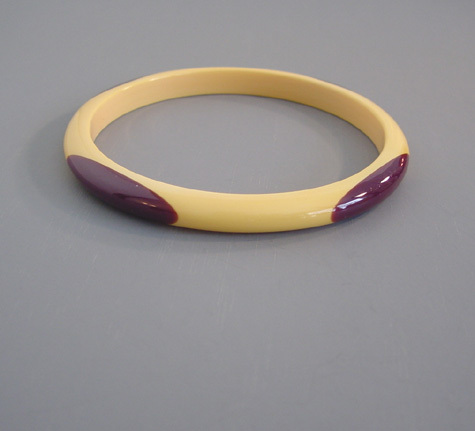 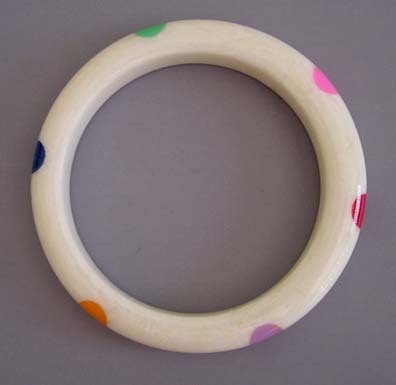 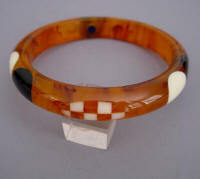 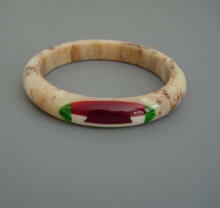 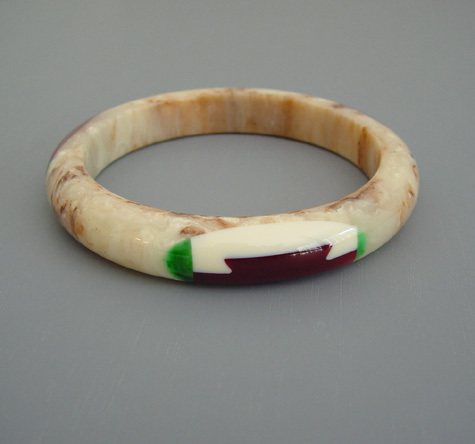 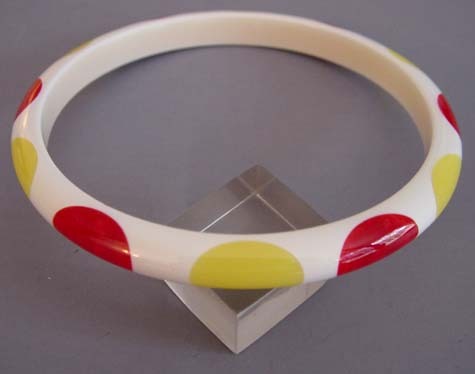 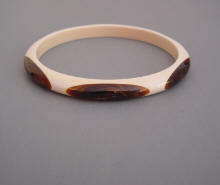 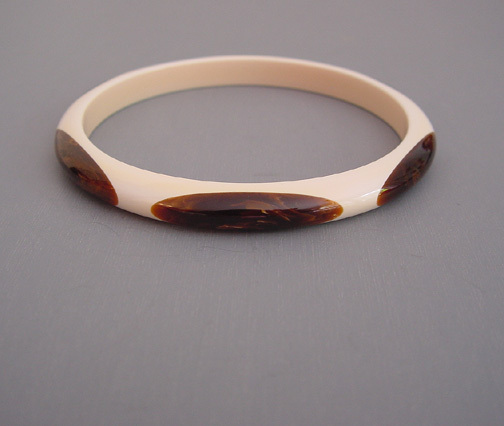 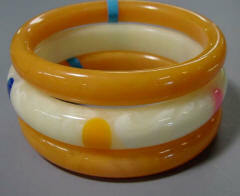 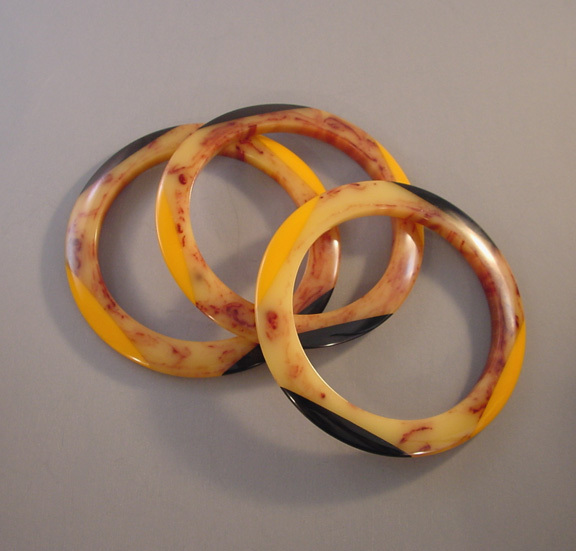 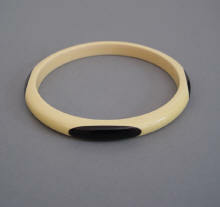 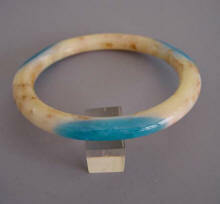 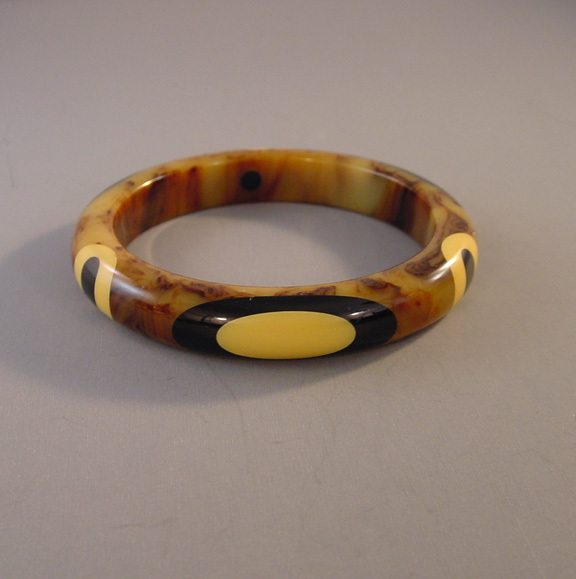 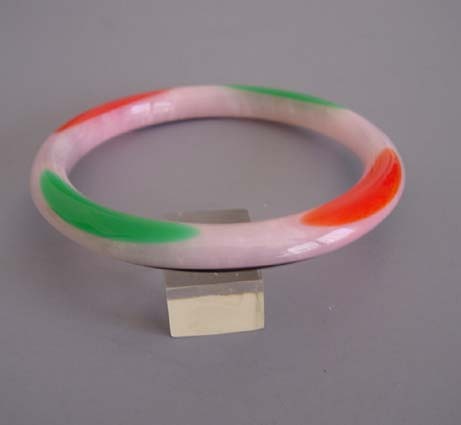 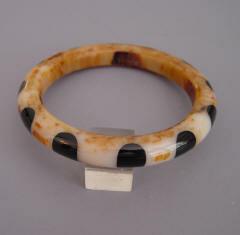 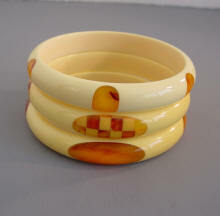 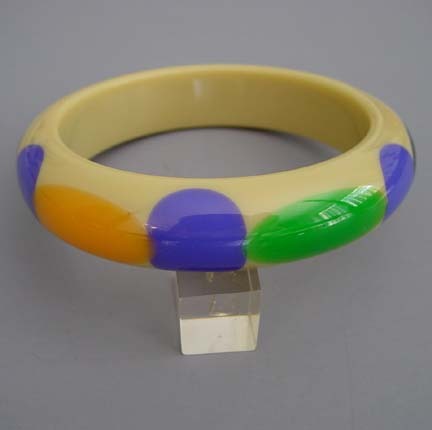 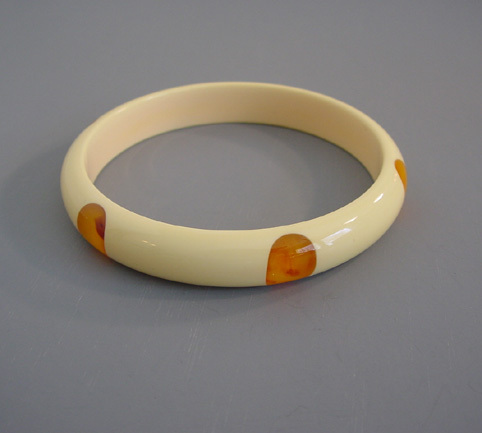 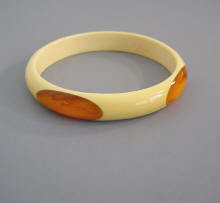 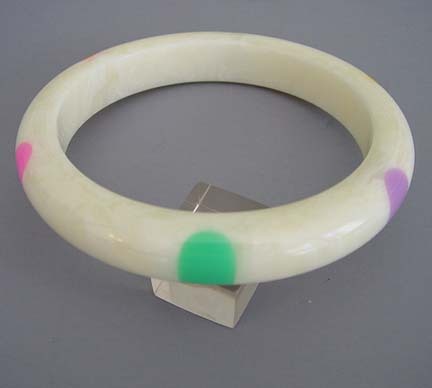 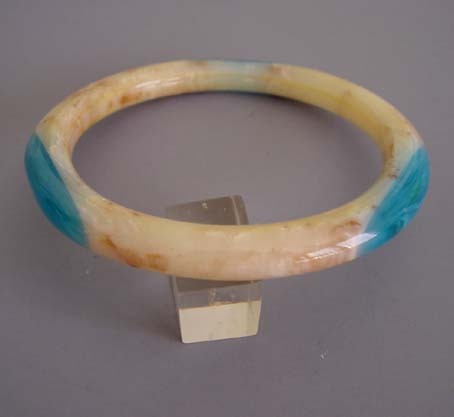 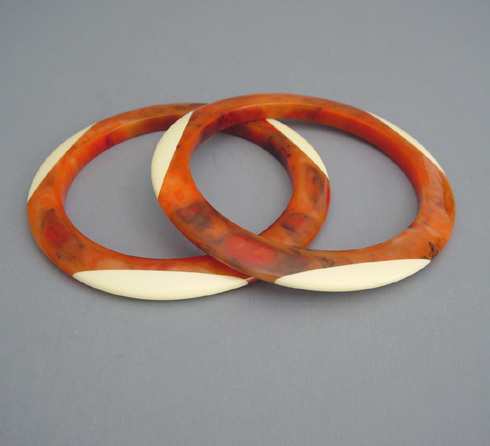 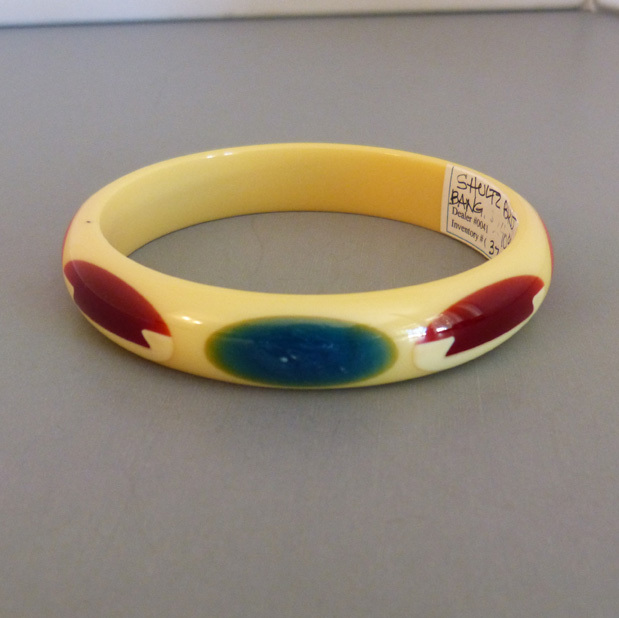 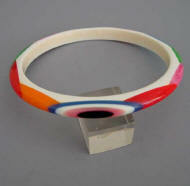 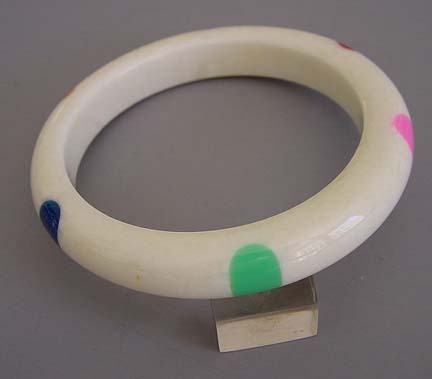 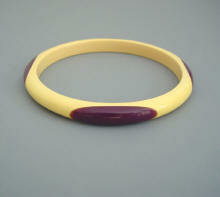 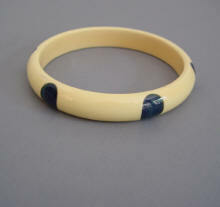 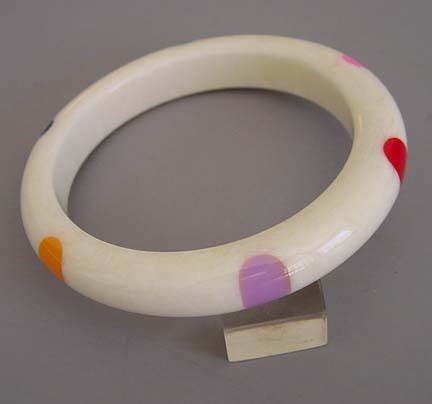 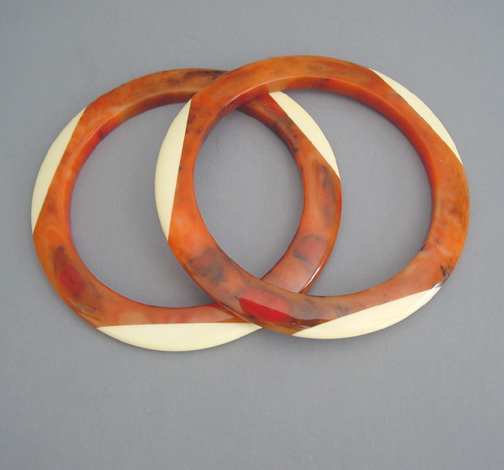 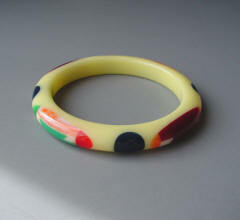 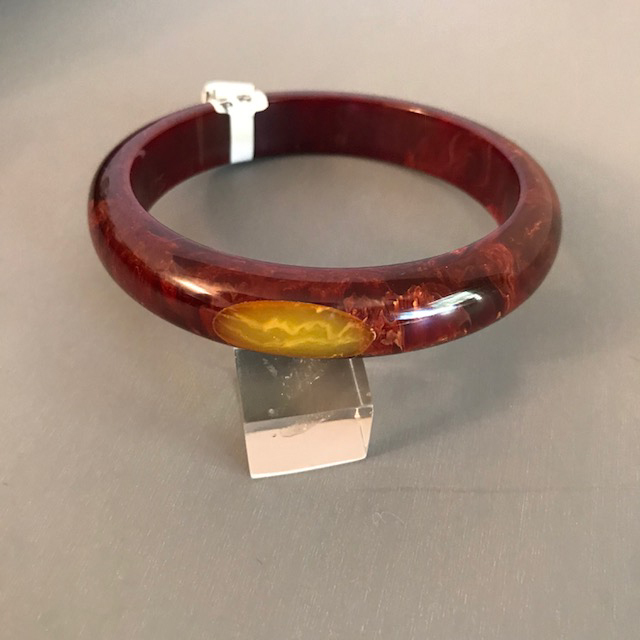 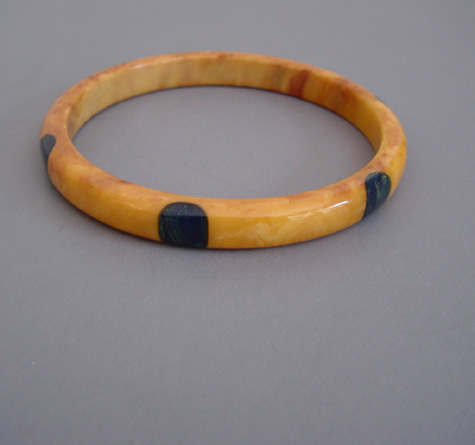 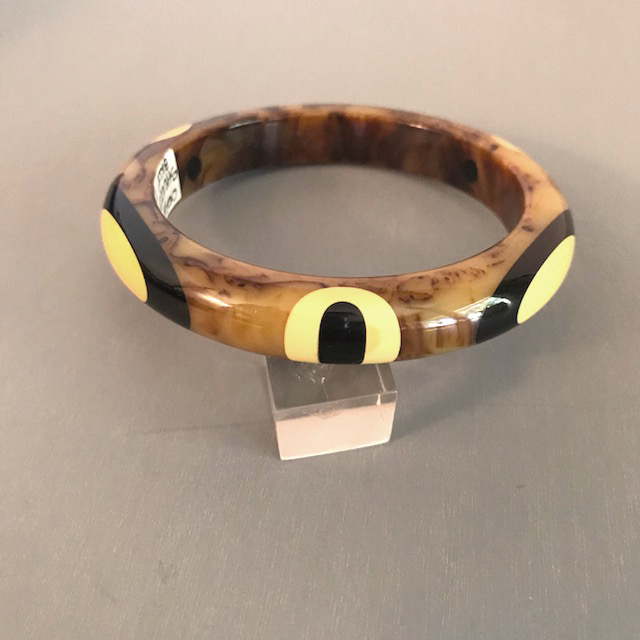 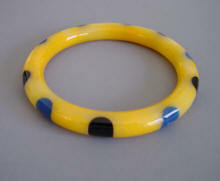 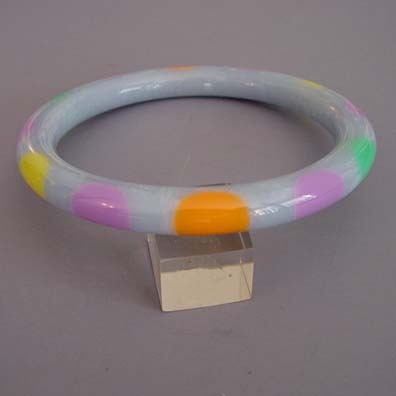 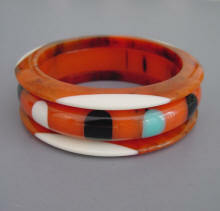 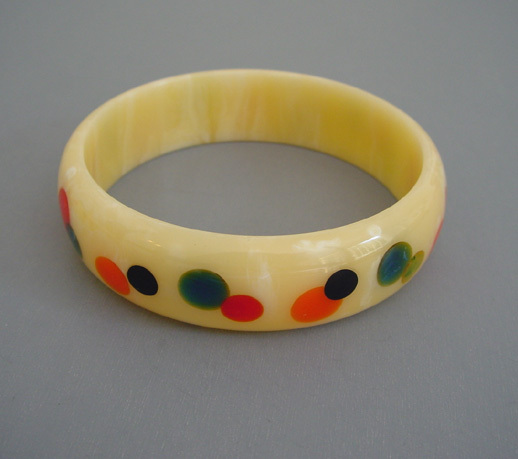 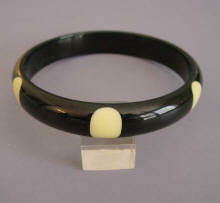 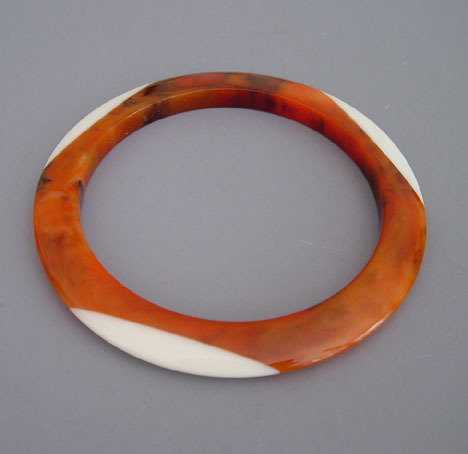 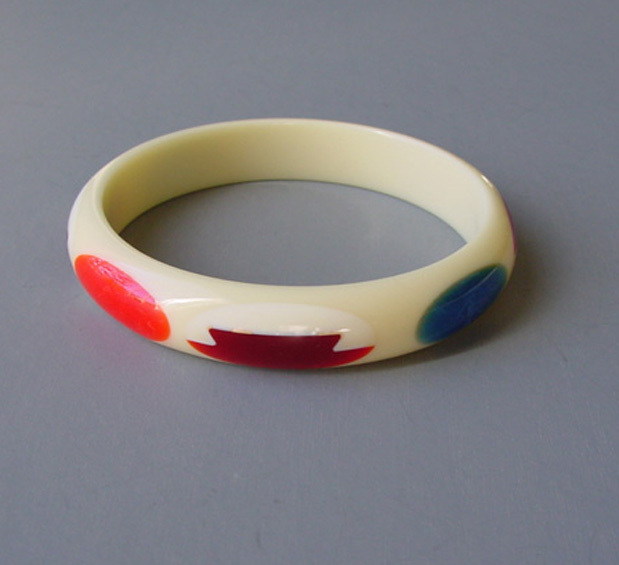 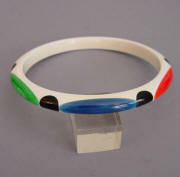 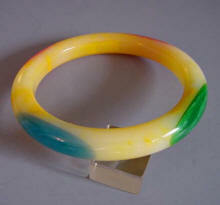 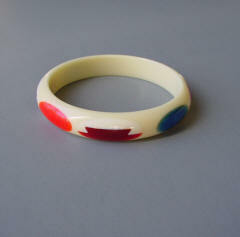 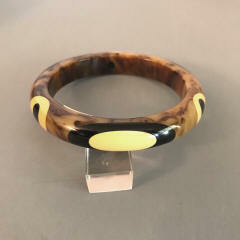 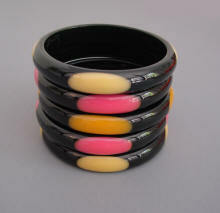 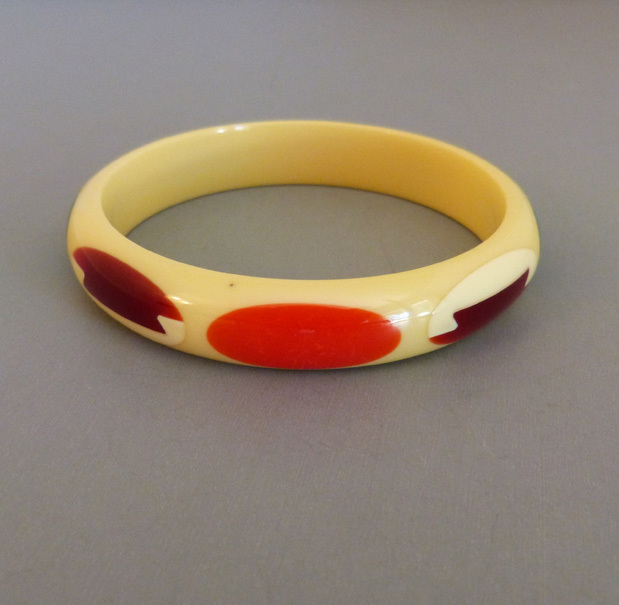 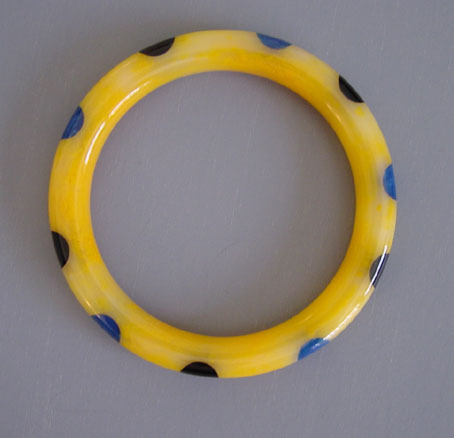 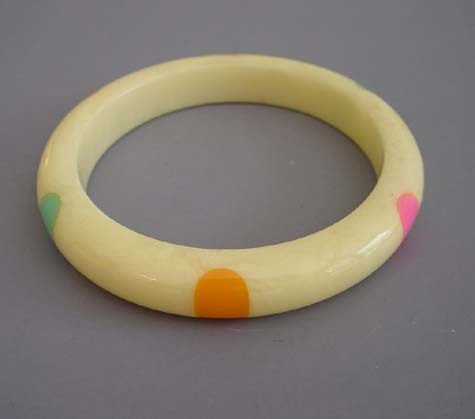 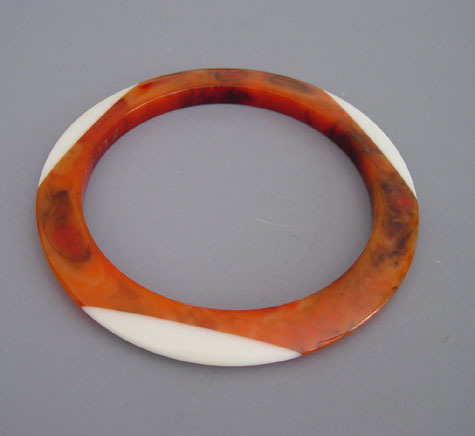 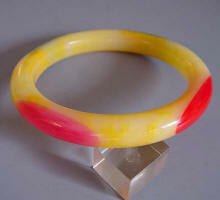 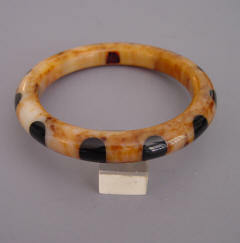 BAKELITE Shultz marbled cream dotted bangle with a set of buttery marbled vintage spacers. 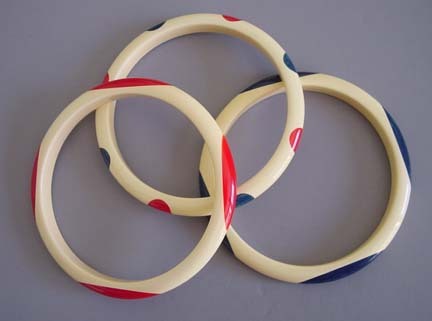 SHULTZ cream spacers with oval dots.